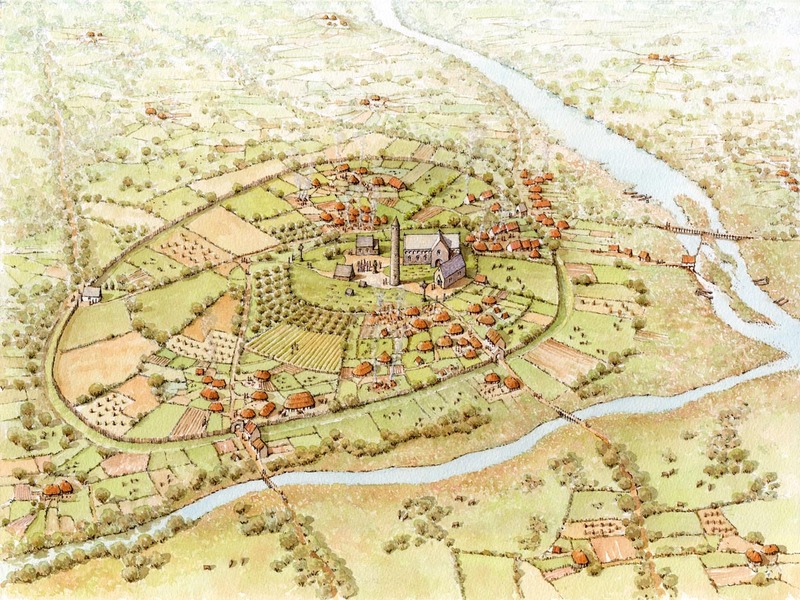 This view shows the monastery in 722AD during the burial of King Redh Laighen of Connacht following the Battle of Allen. Newry Abbey was founded as a daughter abbey to Mellifont in 1153 with its name Viride Lignum (meaning the green tree) thought to have been derived from a yew tree planted by St Patrick and believed to be the origin of the name Newry. After the Dissolution of the Monasteries the abbey was converted into a college and survived in some form until the mid 18th century when most of the area was developed into the modern town of Newry. Nothing now remains of the abbey other than street names and a possible stone from this recreated doorway, built into a wall at the present Newry and Mourne Museum at Bagenals Castle. Tullaghoge fort was believed to have been constructed as a place of ceremony rather than defence and was occupied by several Celtic dynasties including the Cenél nEógain and therafter the O'Neills. 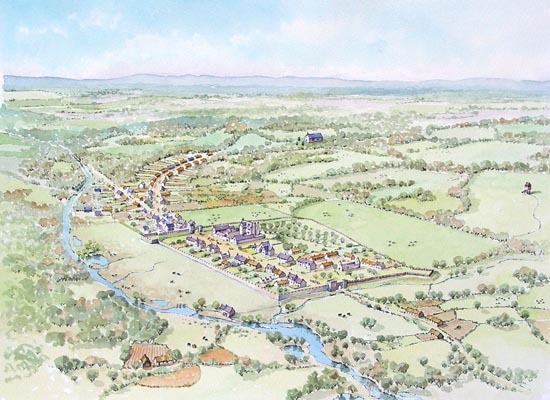 Tullaghoge became famous as the inauguration place of the O'Neills and an early Bartlett map shows a stone chair - the Leac na Rí - that originally stood outside the fort. During recent work for a car park near the site, the remains of timber framed houses were found. 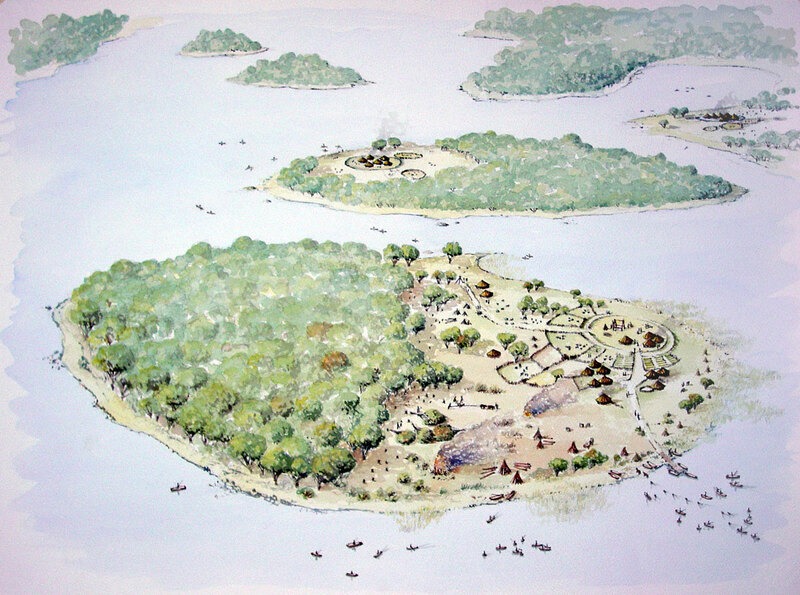 The area was excavated and has been preserved for the visitor. 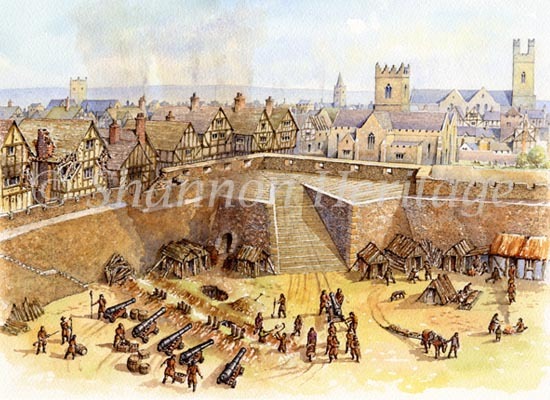 This view shows how the timber framed buildings may have appeared. The fort is shown in the background at the summit of the hill. This view shows a cutaway view of the largest of the houses, probably a hall. Errigal Truagh is believed to have existed from the 9th or 10th century however no current evidence exists to support this other than suggested by its townland name of Mullanacross. Its name is derived from 'erigal' meaning oratory and 'truagh' meaning 30, possibly an indication of the land division it occupied. 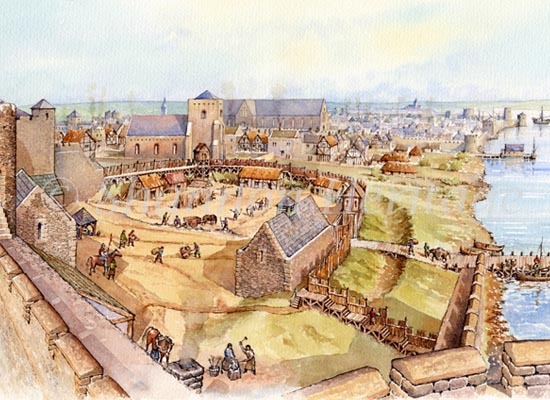 The view shows the site during the late medieval period, when the church was much the same size as seen today, albeit now mostly ruinous. The name of Mullanacross suggests that a high cross existed at the highest point. On the left of the view, beside the stream, is the site of St Mauden's Well, named after the patron saint of Errigal Truagh. 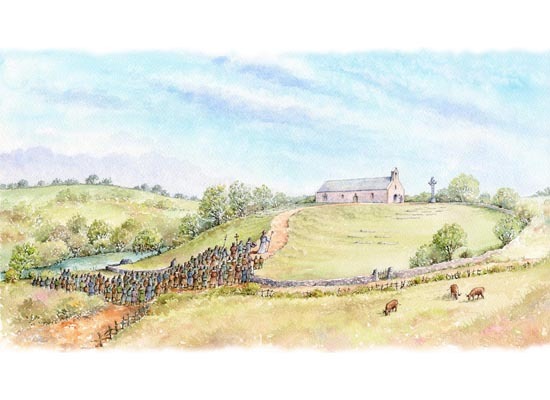 A procession is being led from the well and through the graveyard up to the church. Above the door of the church is a 'sheela na gig', a stone carving of a grotesque female with uncertain interpretation, thought by some to be a pre-Christian fertility symbol and by others as a representation of lust. This artefact is currently held by the Ulster Museum. 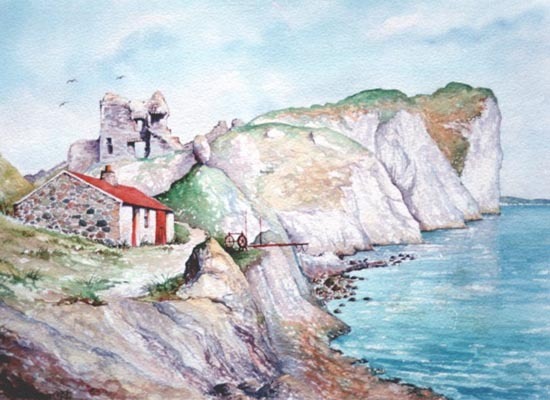 The first castle was built by John de Courcy in the years after 1177, following the occupation of Ireland by the Anglo Normans. 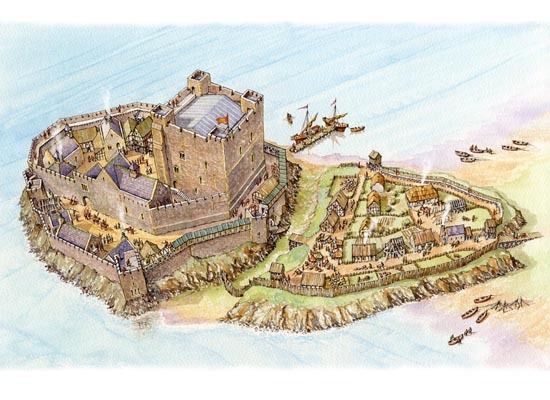 It was built at the extreme southern end of a rocky peninsula known as Fergus's Rock, hence the name Carrickfergus. 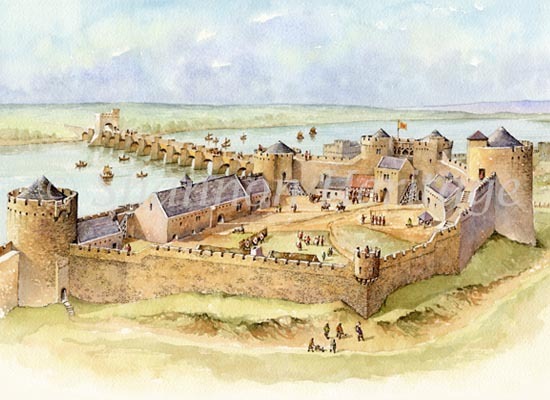 The fortification consisted of a high stone curtain wall enclosing a 'ward' within which were a number of buildings, including a chapel, kitchens and a large hall. 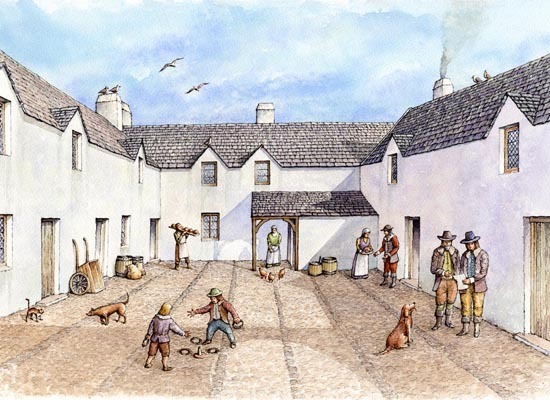 There would also have been accomodation for the garrison and stables for their horses. Also accessible from within the ward was the massive tower or 'keep' used by De Courcy and his wife Affreca. The original main gate of the castle is shown and this is still visible today, albeit blocked up. The castle was further defended by a ditch cut into the rock, effectively making it an island. 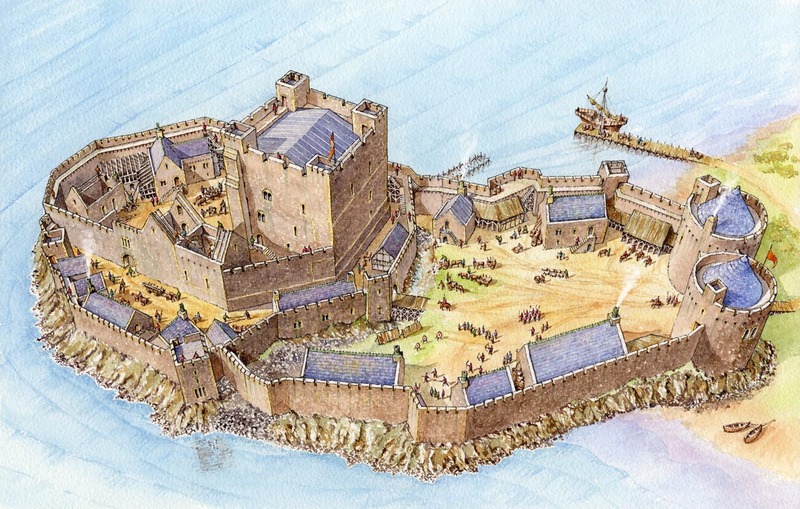 In 1205 John de Courcy was ejected by another Anglo Norman knight - Hugh de Lacy who, like his predecessor, antagonised King John to the point that he came to Carrickfergus himself to deal with the castle. John besieged the castle and eventually captured it, bringing it under full Crown control. Additional fortifications were added in the form of an extension to the original curtain wall, creating another ward and helping to defend the original entrance into the inner ward. Much of this wall survives up to the tower (known as the sea tower) seen in the foreground. The section following the line of the rock cut ditch was later removed however its foundations are still visible. 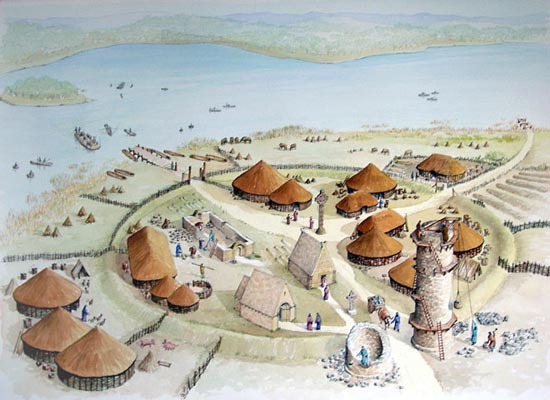 It is likely that a timber pallisade surrounded the remaining part of Fergus's Rock and enclosed a civilian population depending on the castle for security. 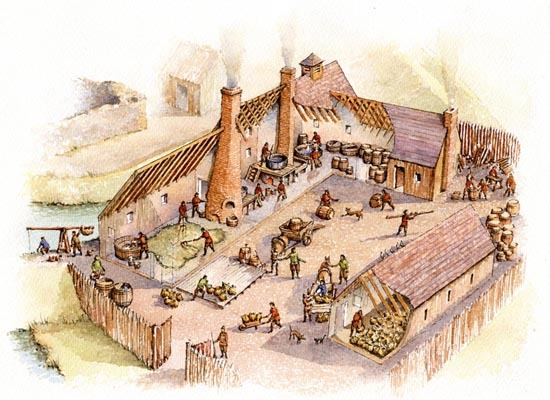 This would have been like a small village with tradesmen, blacksmiths and a market area. 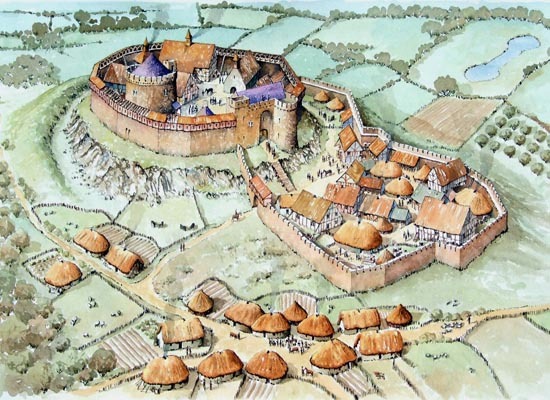 After 1228, Hugh de Lacy again found favour with the Crown and was reinstated as Earl of Ulster, once more gaining residency of the castle until his deat in 1242. 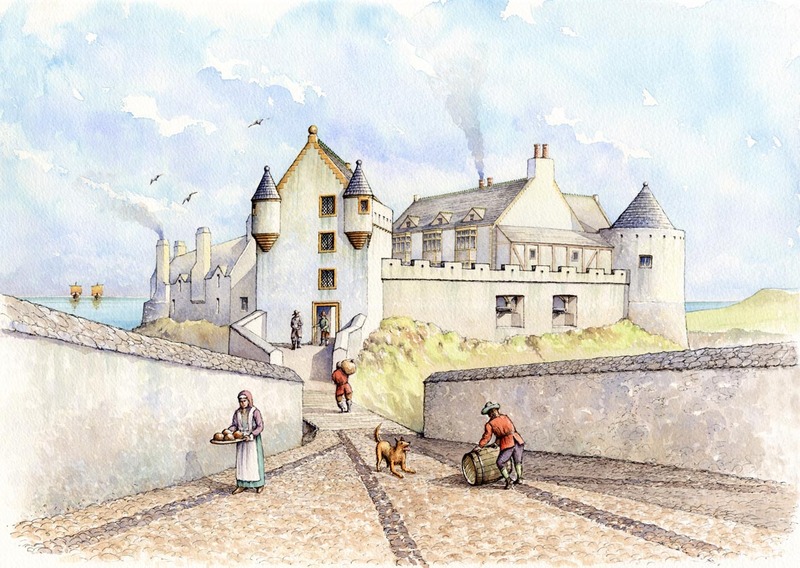 It was probably during this period that a more ambitious extension was added to the castle, in such a way that it now occupied the whole of Fergus's Rock. This formed what is called the outer ward and boasted a substantial twin towered gatehouse at the extreme northern end of the rock. 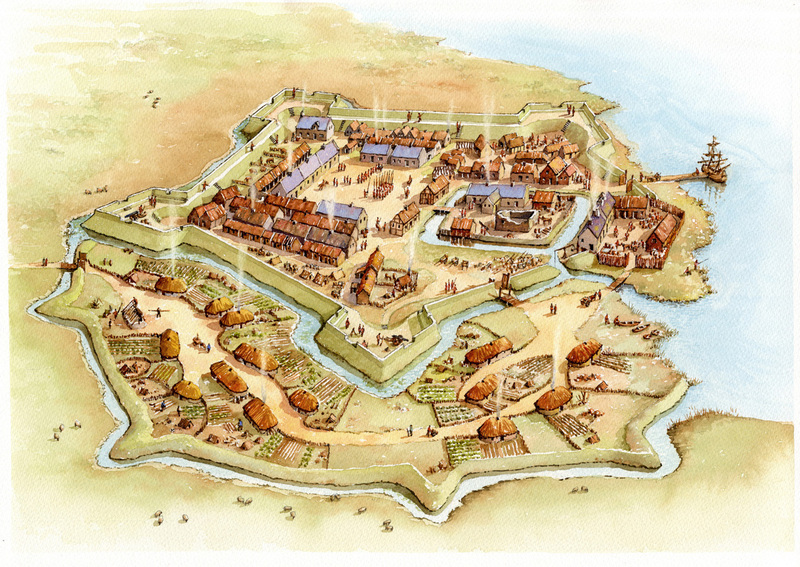 This development freed up much more space for the garrison and it is probable that some of the buildings in the inner ward were dismantled at this time to provide more space in this confined area. The former chapel was relocated within one of the gatehouse towers and either the hall was considered redundant or similarly relocated within the outer ward, as were the stables and soldiers quarters. By the mid 16th century, battle technology had developed to the extent that the castle would have been unprepared for an attack involving artillery. Extensive modifications were carried out in the inner and outer wards by piercing gun ports into the curtain walls. These are quite visible even today and are easily identified by the use of brick inside and outside the walls to form the ports. These ports also required gun platforms that were built up against the existing walls. The twin gatehouse towers were also partially demolished to form semicircular or 'half moon' batteries with reinforced platforms to support cannon. A map of 1560 shows the gatehouse as partially dismantled and the keep without a roof. 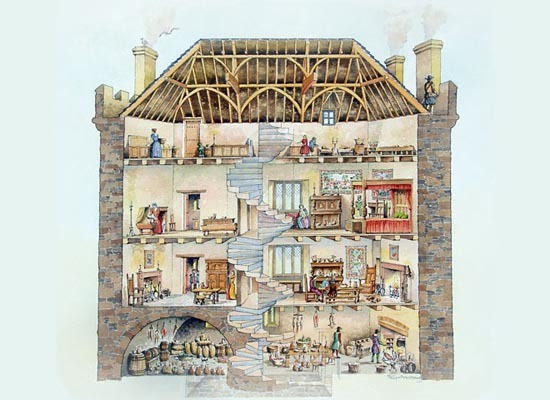 It's likely that the original 13th century roof (perhaps constructed of leaded sheets) needed to be replaced at this time and was given a double-ridged slated version, supported internally by a newly constructed arch, visible in the upper floor of the keep. This type of construction is currently being considered by the DoE to replace the current leaking 19th century roof. 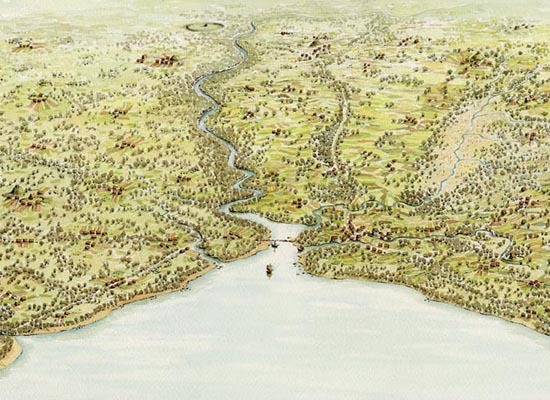 This view is mainly based on the 1560 map. 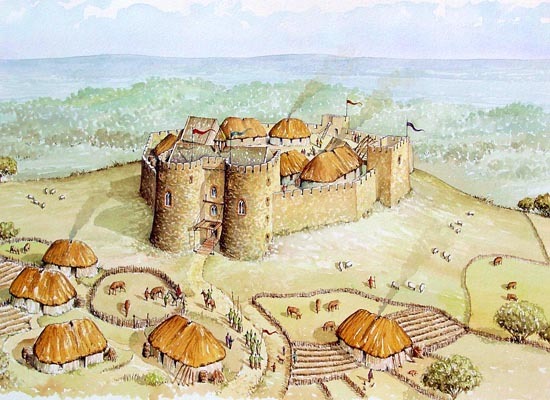 The keep was the main residential and administrative structure of Anglo Norman castles. 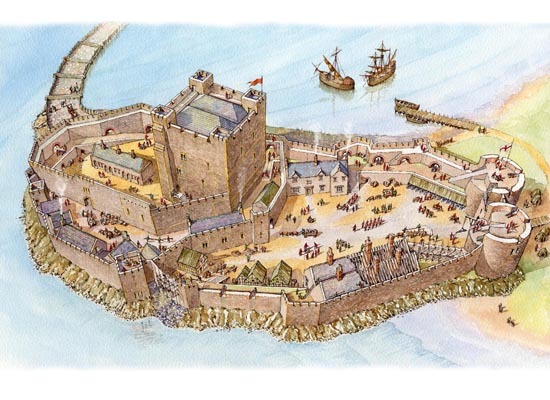 The keep at Carrickfergus was built originally by John de Courcy shortly after 1177. It was of massive construction and would have been considered the most secure part of the castle. It stands over 20m tall and has four main floors, mostly in the original 12th century positions. Access to the keep was from a first floor entrance with a main spiral staircase leading both up to the second and third floors, and down to the vaulted ground floor. This ground floor had no doors to the outside and was probably used for food storage and preparation. The first floor would likely have been for local administration and ordinary folk were admitted to resolve issues with Crown officials. 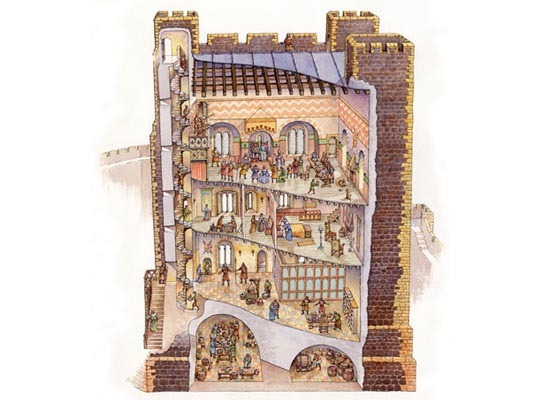 The second floor was probably the private apartment of the encumbent Lord and his Lady with their own en-suite latrine accessed by a private staircase from the bedchamber. 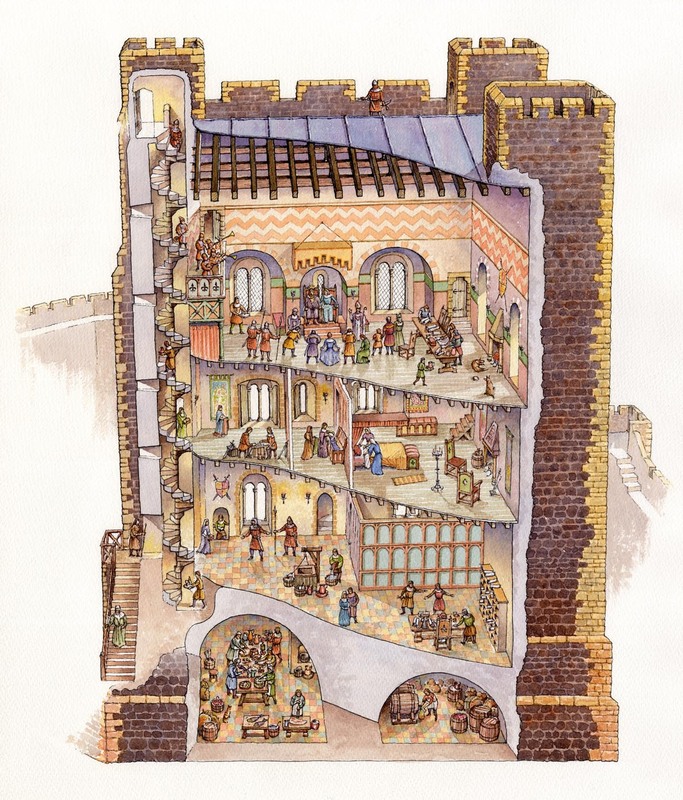 The top floor was the main hall and was most likely used for formal courts hosted by the Lord of the castle. Recent investigation confirmed the possible location of a raised gallery, most likely used by minstrels to entertain the guests below. 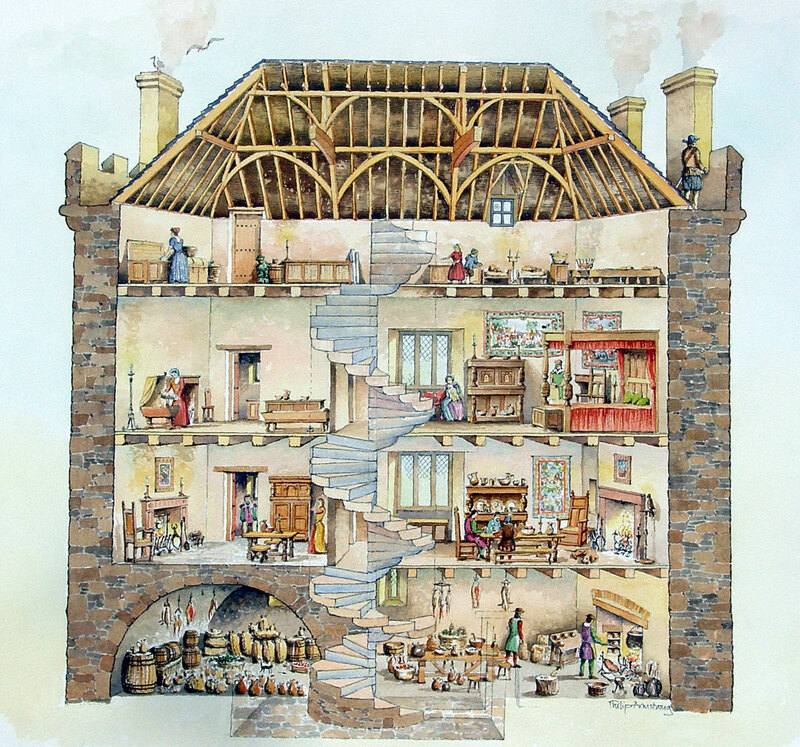 This illustration was prepared for the Down County Museum as a wall mural for their new tea room. This facility, part of a recent extension to the museum, has superb views over the surrounding countryside including the Quoile River, the Anglo-Norman fort and distant Inch Abbey. 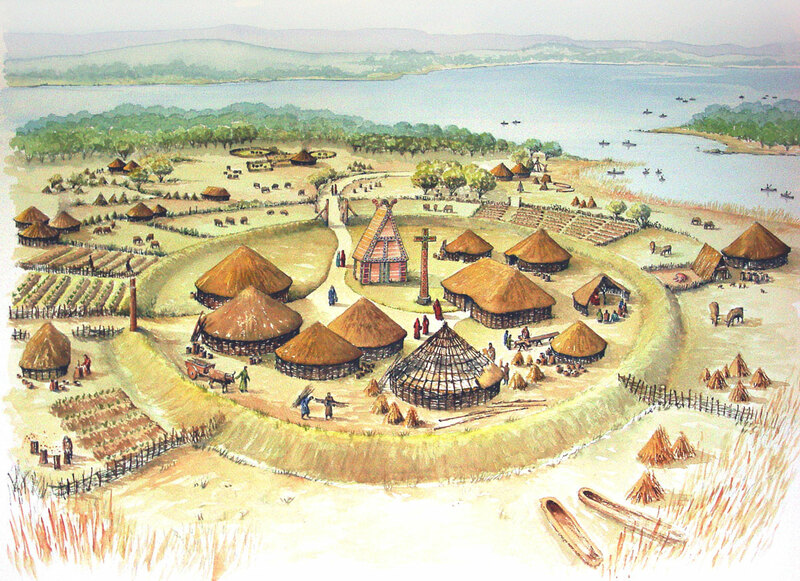 In addition, there is a spectacular view of the Hill of Down, once an island almost surrounded by the Quoile, and the ancient foundation of Dún Lethglaise, the reputed burial place and monastery of St Patrick. 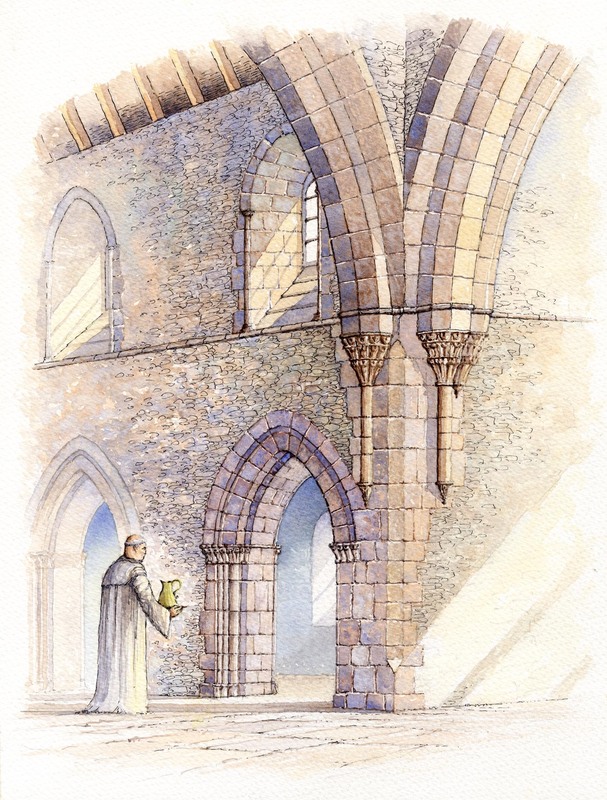 This illustration shows the same view as can been seen from the west windows of the tea room so can be compared with what remains today. 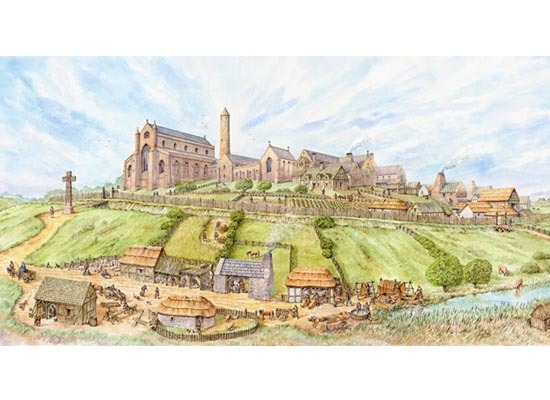 It is based on 13th century reconstruction and shows the Benedictine monastery comprising the main church - now St Patricks C of I cathedral - and the cloistral buildings to the right. St Patricks cross is shown at the entrance to the monastery on the left. There is evidence of medieval trades that were present in the low, somewhat swampy land between the hill and the Museum. 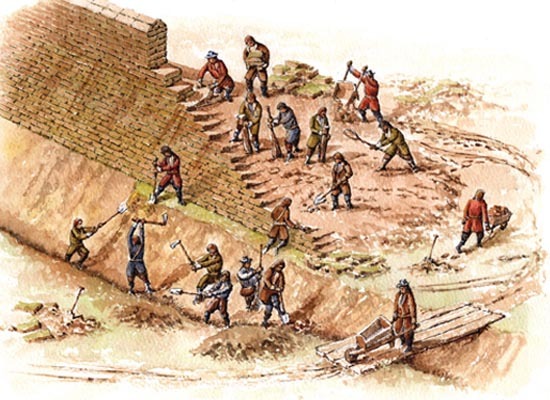 These would have included (from left to right) carpenters, stone masons, butchers, blacksmiths and tanners. 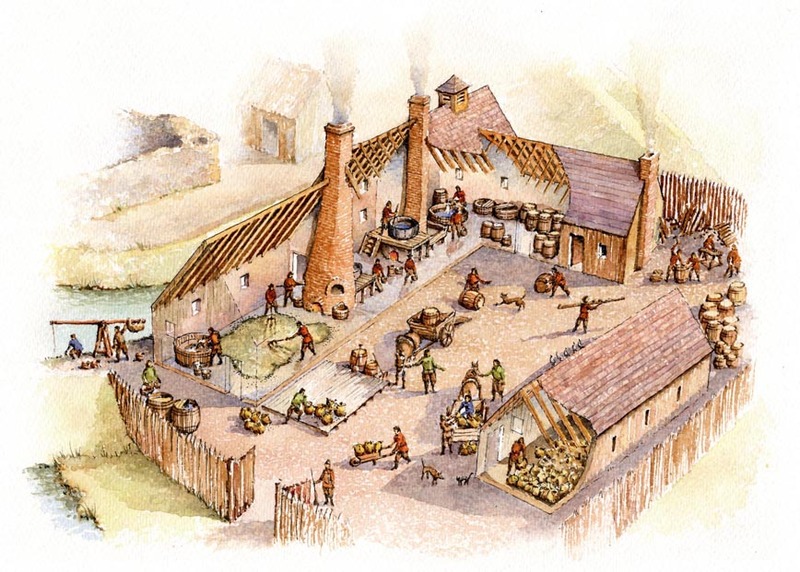 There was also fishing carried out and archaeological evidence of pottery kilns. 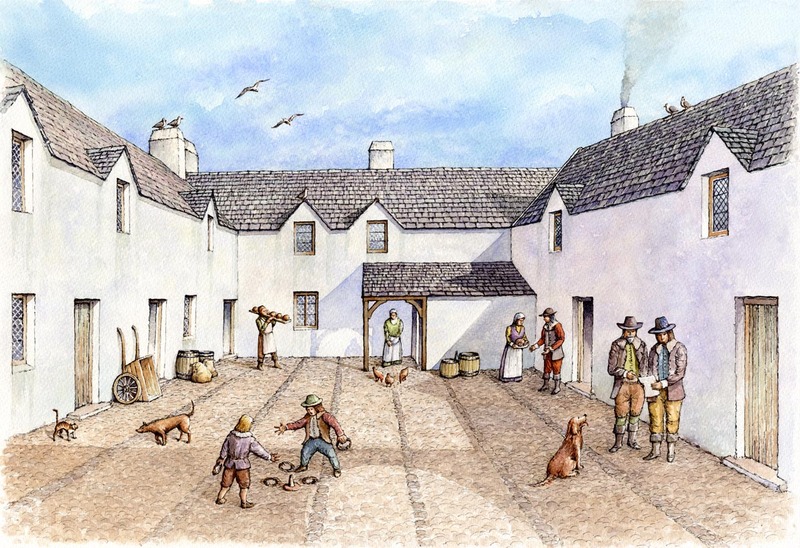 This illustration was used for four large windows that looked out of the new extension of Down County Museum. 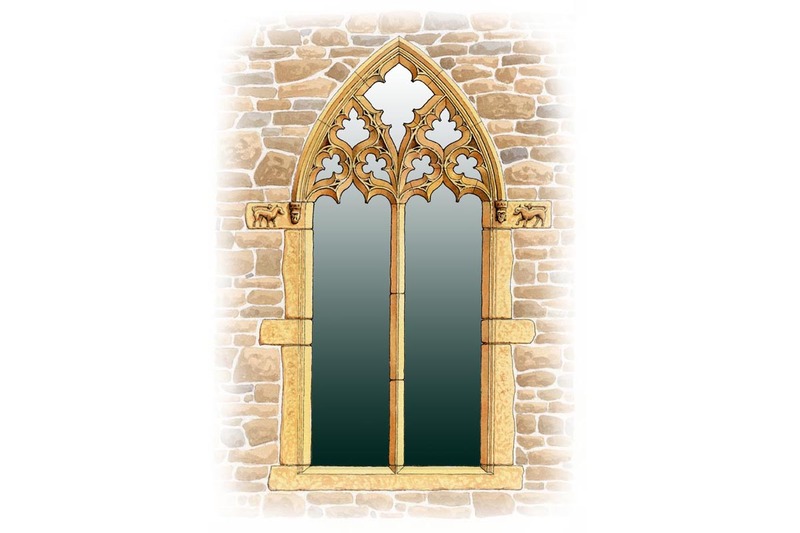 The purpose was both to reduce the amount of direct sunlight entering the room and also provide in indication as how the vista would have looked in the 13th century. 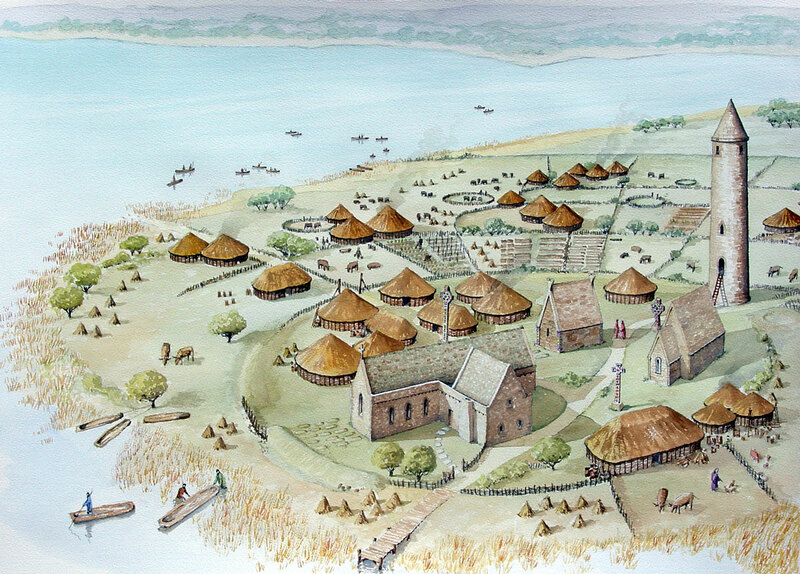 Each of the four sub-panels focussed on points of interest, from left to right, the Hill of Down meeting the water and a pottery kiln, boats and coricals on the lake with Inch Abbey in the background, the Anglo-Norman Mound of Down and, on the right, a routeway leading from Downpatick town to the Mound. 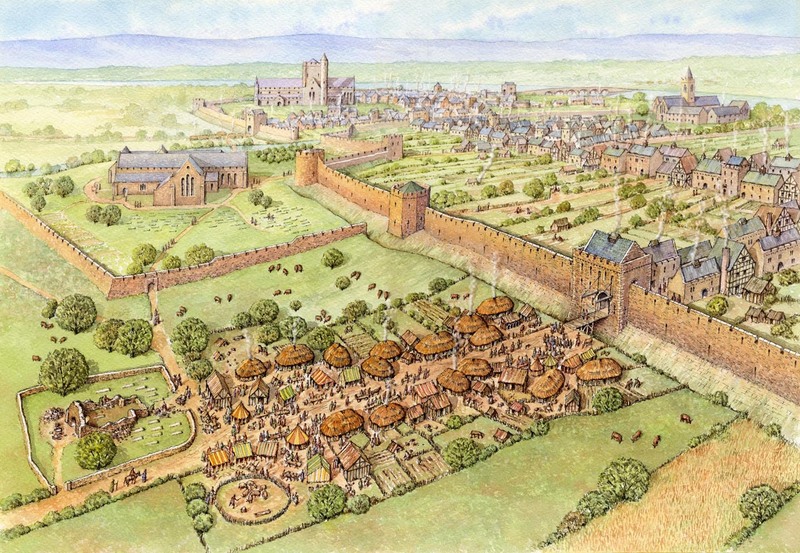 When the illustration was added to the panels, some of the lighter areas were removed to provide the viewer with the ability to 'look through' the scene at the actual background and make comparisons with 600 years of change. The most obvious feature would have been the water level, now much reduced. The sky was made deliberately cloudy to dramatise the effect and to reduce the amount of sunlight entering the area. 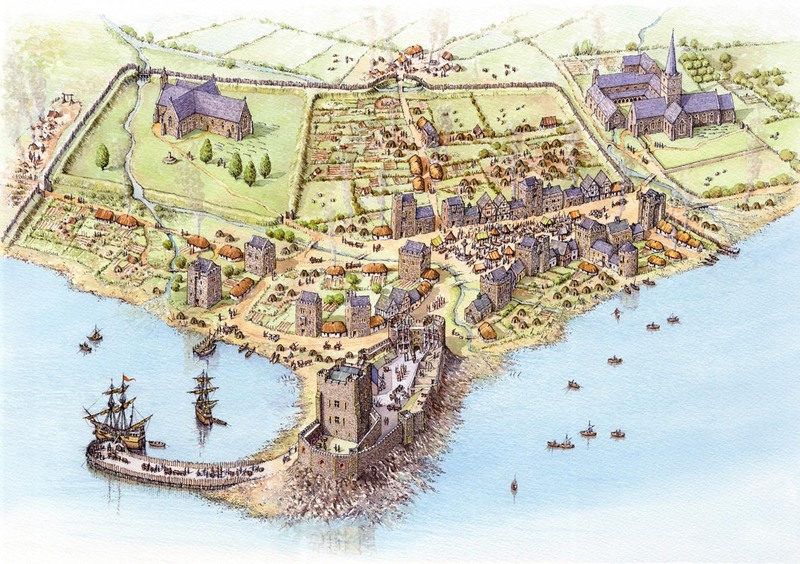 This view was prepared for Carrickfergus Borough Council and was based on the British Library Cotton Augustus manuscript of c1560 along with another map drawn by Robert Lythe in 1567. 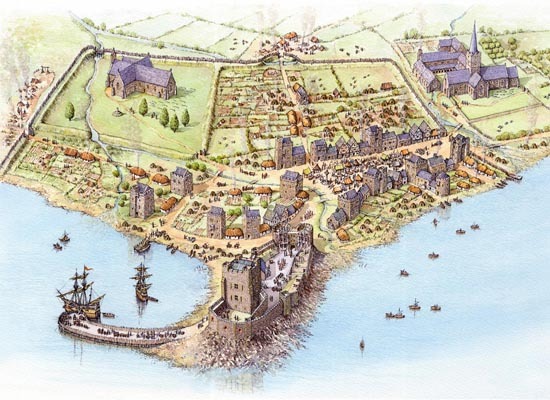 Both these maps are featured in Ruairi O'Baoill's excellent publication 'Carrickfergus - The Story of the Castle & Walled Town'. St Nicholas' Church is shown on the left as a cruciform building and the Friary is on the right. Sir Arthur Chichester's house was built on the latter site. The castle is still identifiable and it was around this time that extensive modifications were being made, especially within the outer ward. A market scene is shown in High Street. 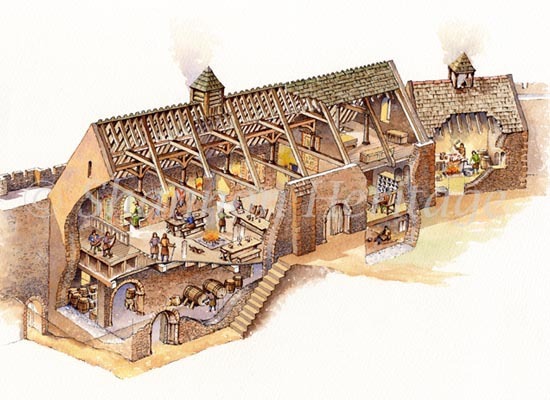 Note also the different dwellings in use at the time, small 'beehive' huts for the poor, thatched cabins for the 'middle' classes and timber framed and tower houses for the wealthy. 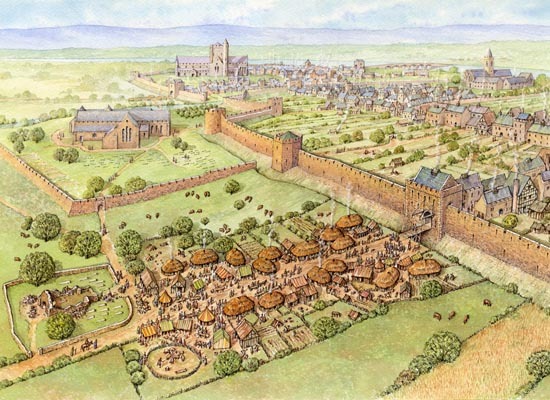 Outside the West Gate (on the left) can be seen pottery kilns and beyond that the town gallows. 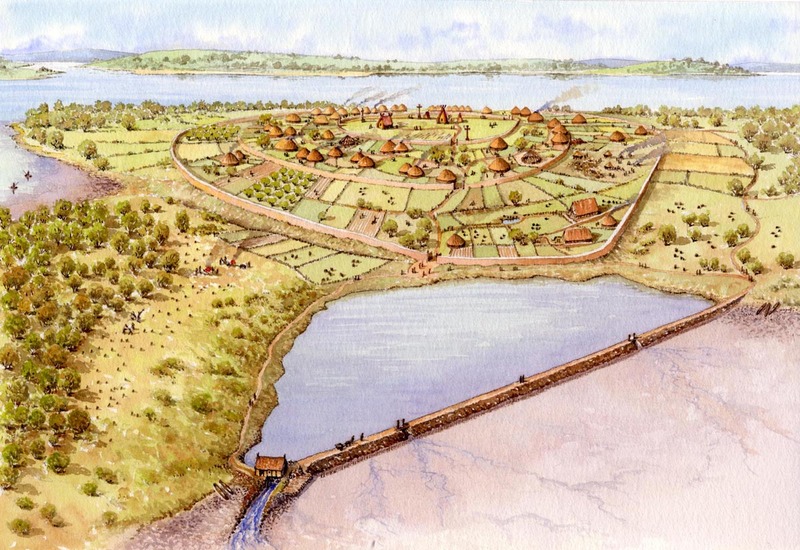 Around 1600 Henry Docwra arrived in Ulster where he fortified various settlements, including that at Derry. The main fortification was around the medieval Dubh Regles (where the present St Columb's cathedral now stands), seen in the centre. This was an earthen rampart surrounded by a ditch and with a number of bastions at the corners. 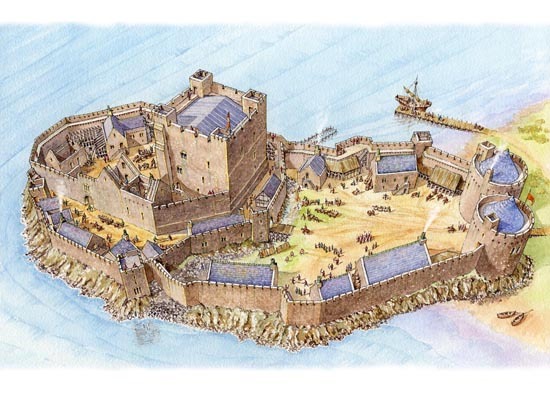 Other areas fortified at this time were around O'Doherty's tower and at a point at the far south of the island as well as the ruined nunnery close to the Dubh Regles. 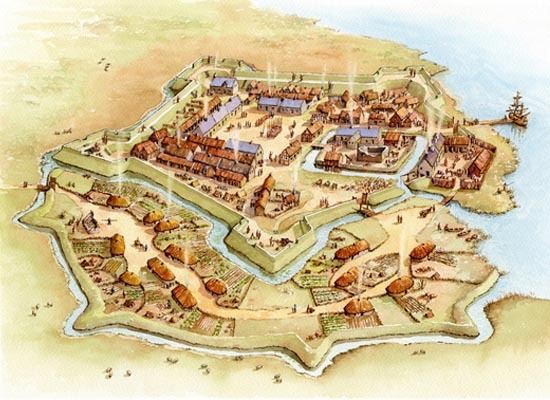 We can start to see how the present city began to materialise, with a settlement between Docwra's main fort and that at O'Doherty's tower. 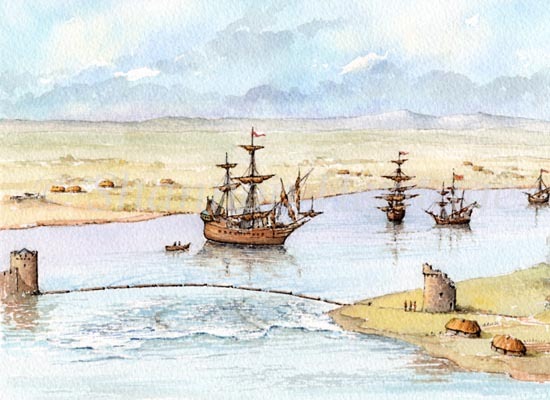 Much of the trade would have entered at the area close to the tower and was later to become the ship quay. Teampall Mor is in ruins, mostly due to a gunpowder accident about 30 years earlier and the Augustinian abbey has also become derelict. 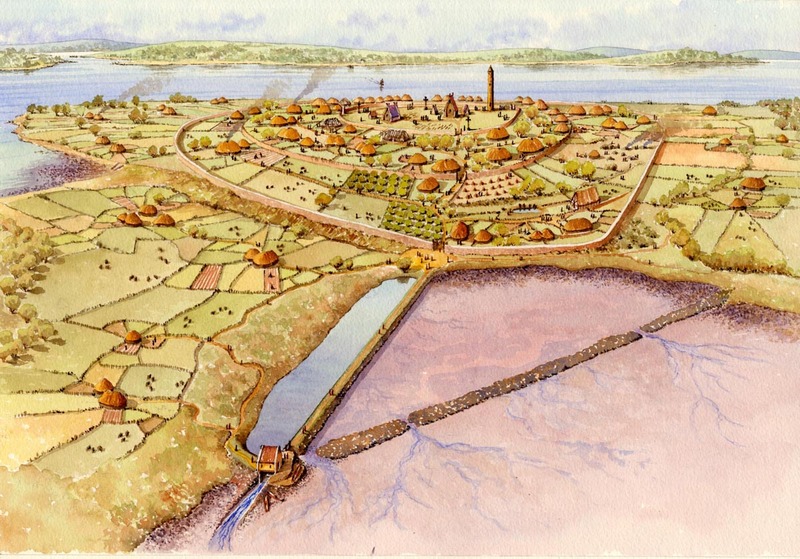 This was one of five illustrations I prepared for Ruairi O'Baoill's beautiful book on Ulster's maiden city- 'Island City: The Archaeology of Derry/Londonderry'. The name 'Derry' derives from Doire Colmcille, anglicised to Columba's oak grove. Colmcille founded a Christian monastery here in the 6th century, prior to setting sail for Iona in 563. The monastery is believed to have been small, having a timber church with carved and painted gables and antae (rectangular pilasters at the corners). The long narrow building is a scriptorum where scribes would have prepared illuminated manuscripts. The area around the buildings would have been enclosed by a low wall and have contained a number of cross inscribed stones. The oak grove is shown here just outside the wall. As the monastery may have been built on an earlier site (we suggested a henge in the prehistoric period) this may have been retained to mark the outer extremities of the settlement. 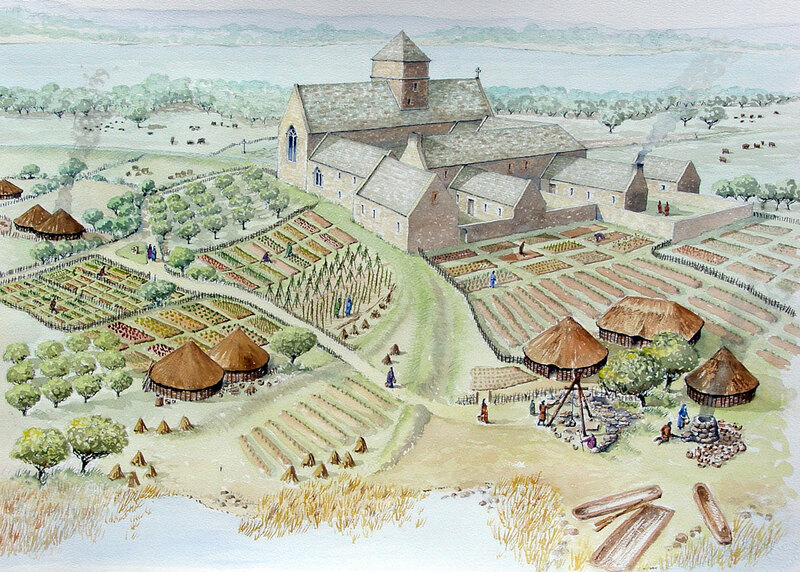 The view shows lay monks removing some of the upright stones from this 'pagan' period. 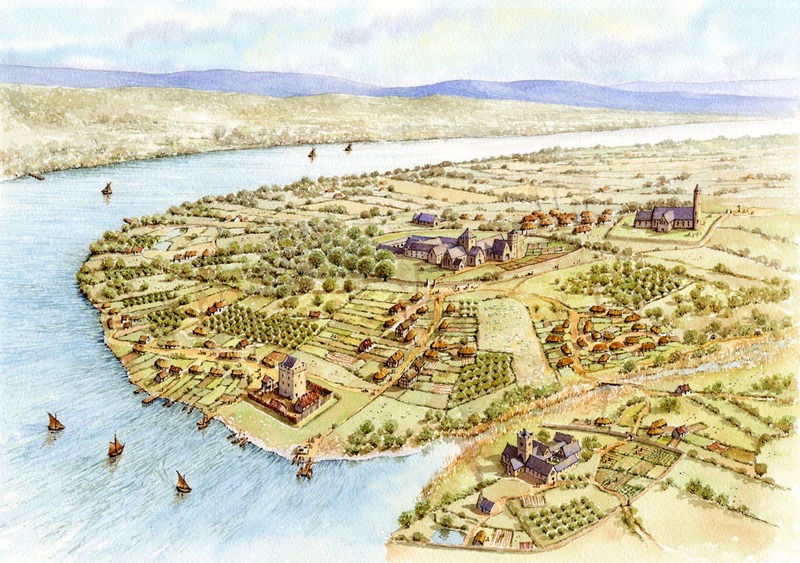 Medieval Derry was dominated by Ecclesiastical establishments. In the centre we can see the Dubh Regles, or Black Church, which occupied the highest point on the island. This is most likely the site of Colmcille's original monastery and I've suggested a small romanesque building joined to the main church that may have superseded the earliest timber and stone structures. The site is now occupied by the present St Columb's cathedral. To the right of the Dubh Regles is the Teampall Mor, or Great Church. This was also known as the Long Tower Church by virtue of the tall belfry in the style of earlier round towers. Due to the religious significance of Derry at this time there would have been a pilgrimage route extending from the arrival point seen in the foreground, up past the Dubh Regles and on toward Teampall Mor. In the left foreground is the original O'Doherty's tower and to its right is the Augustinian abbey. The unmistakeable profile of Dunluce Castle is one of the most dramatic and iconic vews of the North Antrim Coast. 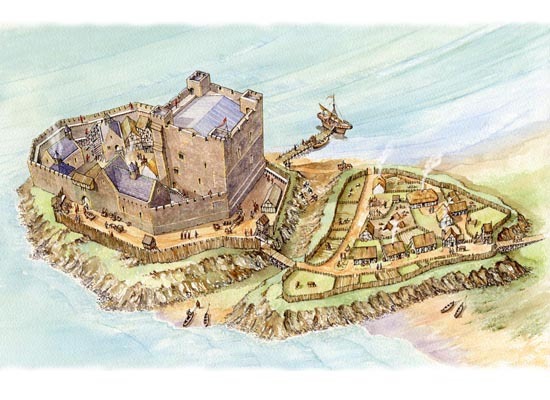 Originally believed to have been occupied by a pre Anglo-Norman fortress the first stone castle was probably built by the MacQuillan family at the end of the 15th century. Their successors, the MacDonnells, are believed to have built the most northern range on the promontory which is known as the Kitchen Court. This comparitively undefended comprised a cobbled courtyard surrounded by mostly servants quarters, stores and workshops. 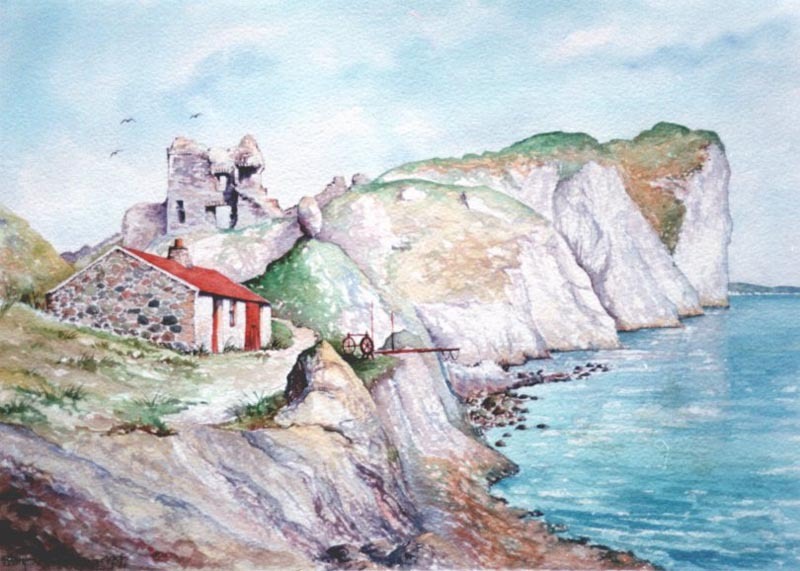 Their successors, the MacDonnells, built the impressive Scottish-style gatehouse, defending the only access to the promontory from the mainland. Their successors, the MacDonnells, extended the castle extensively to include the mainland court. 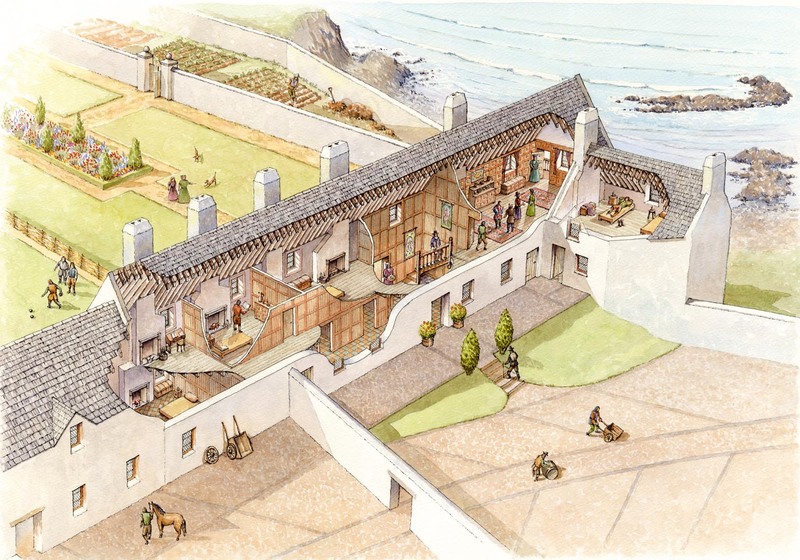 The western range housed the Lodgings - guest accomodation, staff and also a large apartment for Lady Catherine, who was thought to have preferred living here than the exposed rocky promontory. The southern part of the range housed the stables. The ancient reputed burial place of Ireland's patron saint was known as Dún Lethglaise, later Downpatrick, and is just to the south of the present cathedral. Timber churches, crosses and monks cells would have occupied the summit of this hill following the death of Patrick, after which these would have been replaced by more durable stone structures. 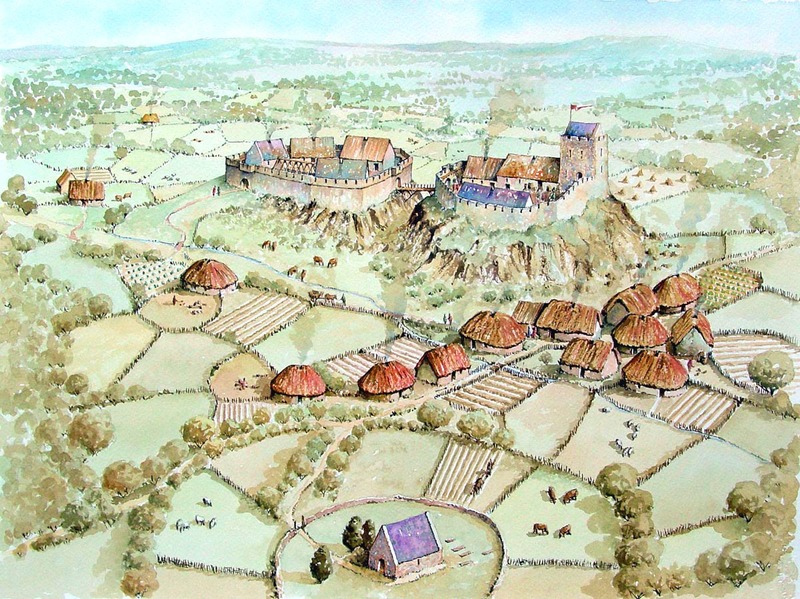 This view shows how the Hill of Down may have appeared in the 11th century. Dominating the site was the round tower, shown on 18th c views prior to its demolition and believed to be just west of the cathedral, nevertheless the foundations of the tower have been particularly illusive to archaeologists. 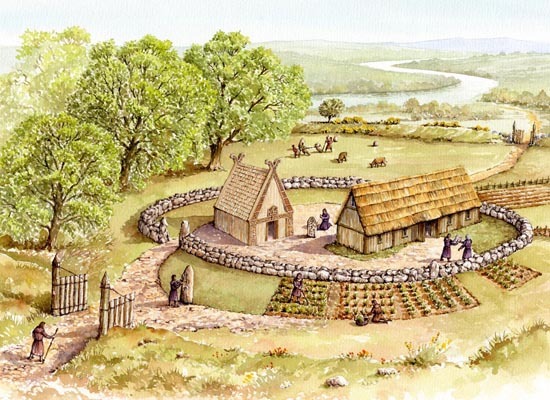 There would have been at least two churches, several stone crosses and a number of timber houses and stores. There would also have been stone tombs and graves on the southern flank of the hill. Evidence was also found of two substantial buildings on the west of the site. 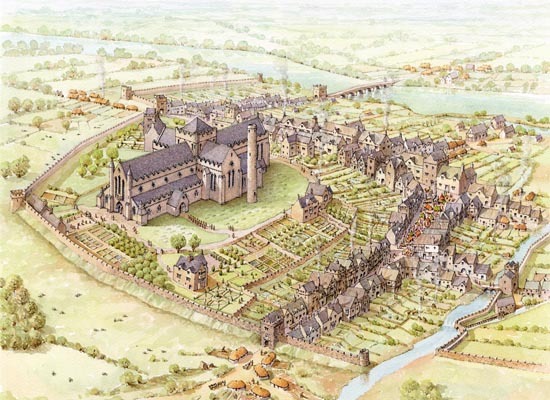 The entire monastery would have been surrounded by a substantial bank and ditch, the complete course of which has been established by recent archaeological investigation. 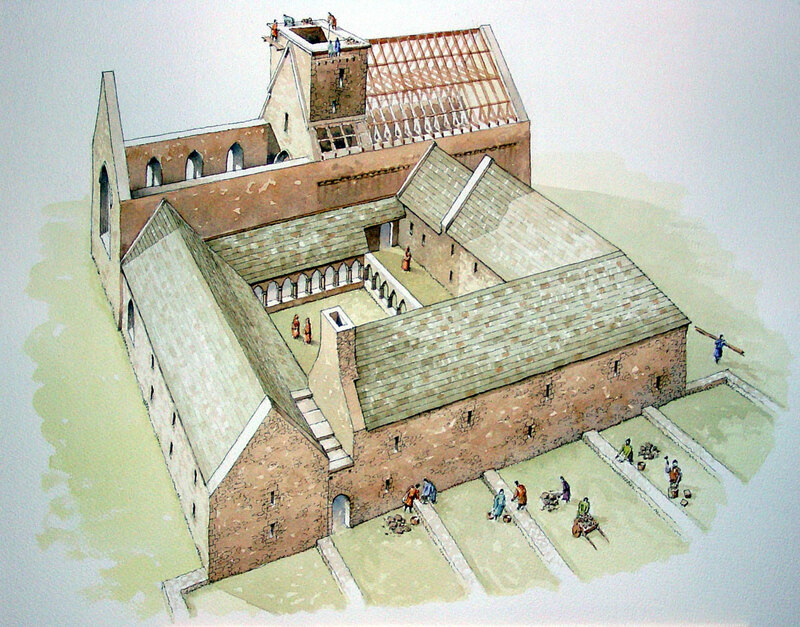 The Hill of Down in the 13th century had become an extensive Benedictine monastery set out in a standard design of a main church with adjacent cloistral buildings. 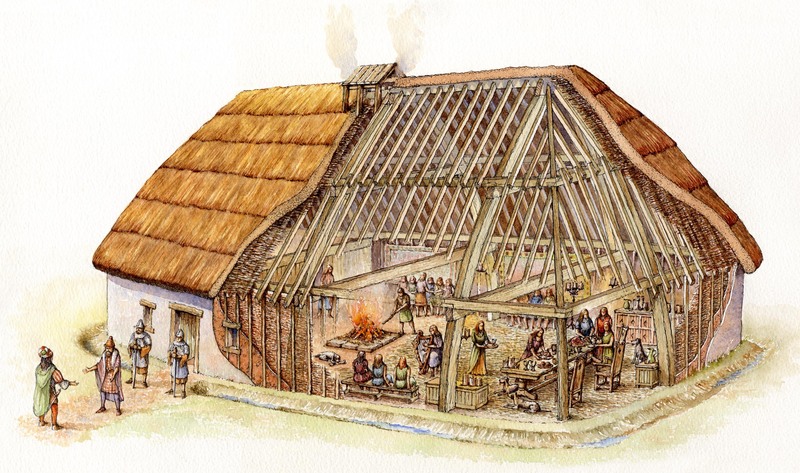 These buildings would have served as a refectory, a chapter house and monks accommodation in the form of private quarters and dormatories. The church itself was similar in size to the present cathedral and, although evidence of an earlier building was found, several modifications were made that can still be seen on the walls inside the building. 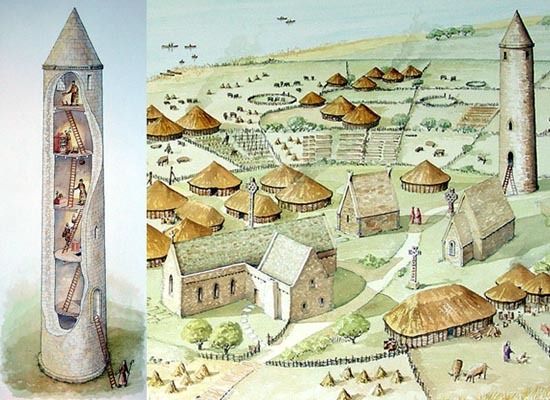 The round tower is still in existence, probably used as a bell tower and it's possible that one or more of the original early churches could also have been retained as was the case in other Irish monasteries. 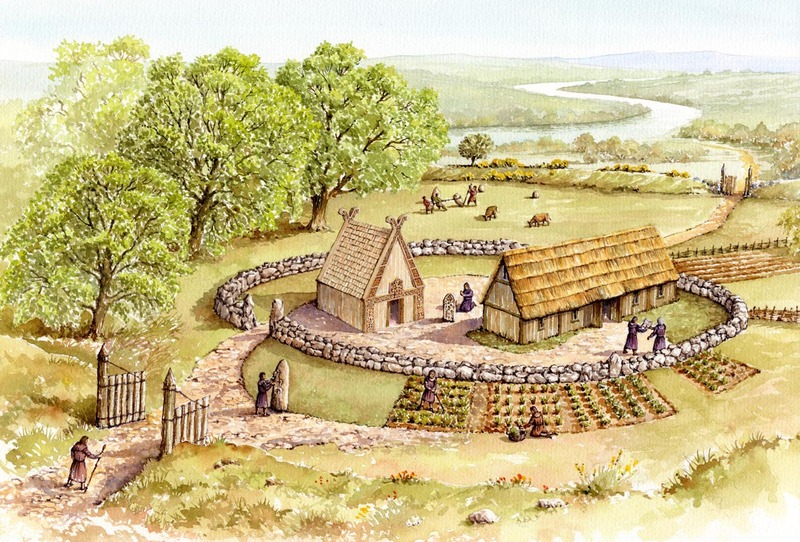 The foundations of two buildings were found during recent excavations at Downpatrick and these may have been guest houses for the many pilgims that would have passed through. 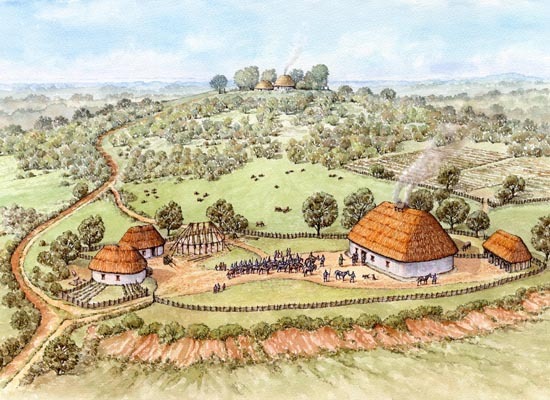 The large perimeter earthwork is still in evidence and would have contained the remainder of the lay community with stables, a bakery, a brew house and various storage barns. 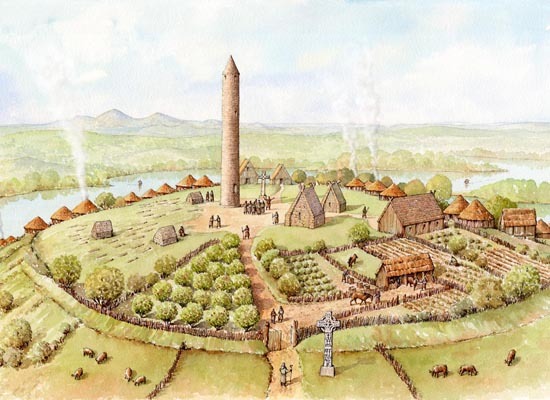 The site is traditionally believed to have been established by St Canice of Aghaboe around the start of the 7th century. Known then as Cill Chainnigh or Canice's church, this later became anglicised to Kilkenny. 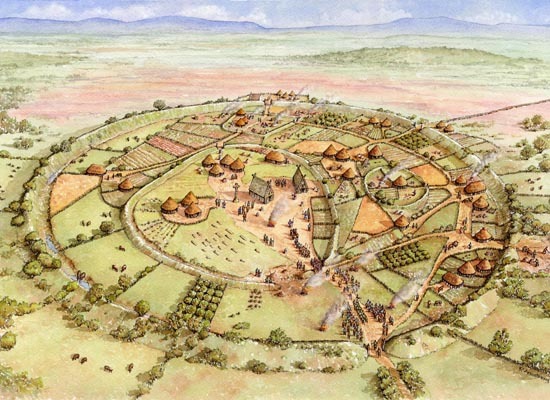 The precinct was arranged with at least two concentric enclosing ditches with the outer enclosure divided into segments or 'trians', much like the spokes on a wheel. Similar layouts are found at other ecclesiastical sites such as Armagh, Downpatrick and Nendrum. 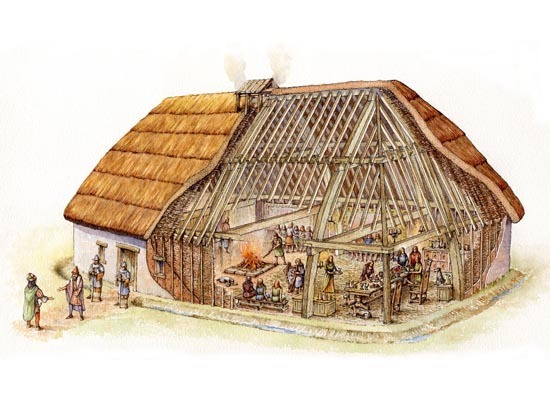 The earliest buildings would probably have been small and timber built. 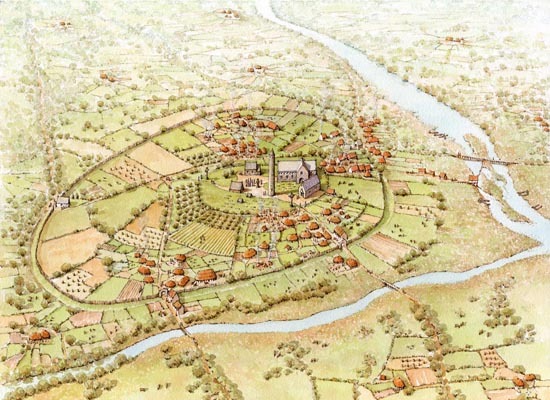 In the 9th century, Cill Chainnigh was transformed by the kings of Ossory from a backwater into a centre of ecclesiastical and royal power and takes its place alongside Kildare, Clonmacnoise, Clonard, Kells and Armagh as a major regional centre. At this time a large church is built in the Hiberno-Romanesque style, recently located using modern geophysical surveying. Another substantial building was located with a north-south orientation, suggesting that this could perhaps have been a royal palace, analogous with other major eccesiastical sites. 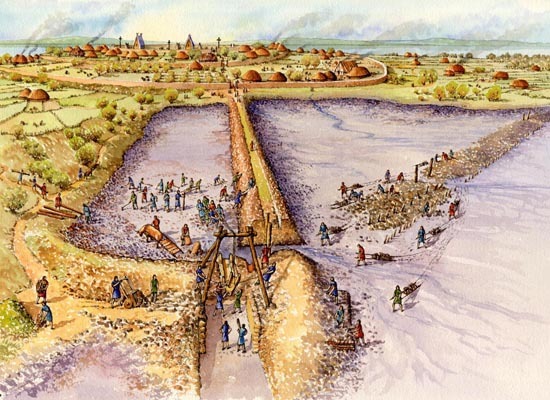 Archaeological evidence shows that the inner enclosure was partly removed, possibly due to a policy of reorganization and expansion. It could also reflect changing perspectives on the meaning of 'sacred space'. This is shown by the presence of craft workers and iron smiths, whose waste-pits pock-marked this area. 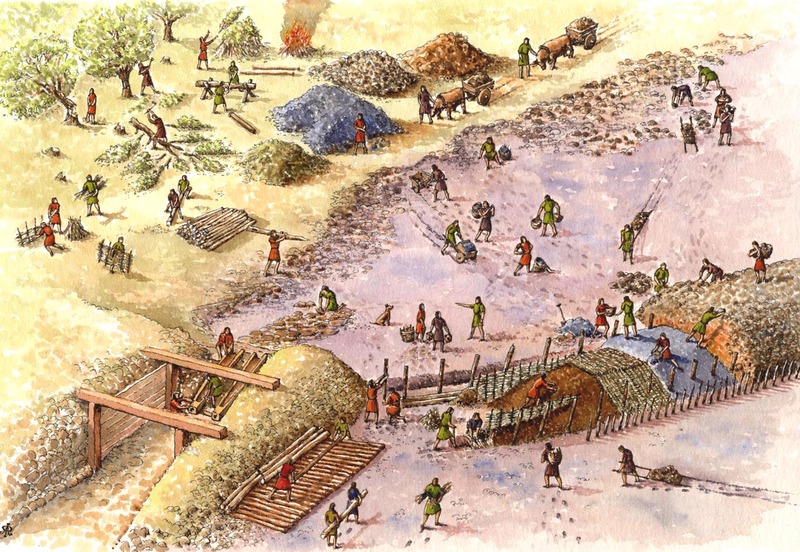 Antler and bone-working, primarily the waste from lowly combmakers, was the main craft represented. The Cathedral was built between 1210 and 1280 over the site of the early medieval monastery, of which the round tower is the only surviving feature. It was built in the west-country Gothic style by the diocese of Ossory’s first Anglo-Norman bishops. It was the second-largest church in medieval Ireland, the largest being St Patrick’s in Dublin, and was built to a cruciform plan with a clerestoried nave of five bays, a south porch, transepts, an aisled chancel and a crossing bell-tower. 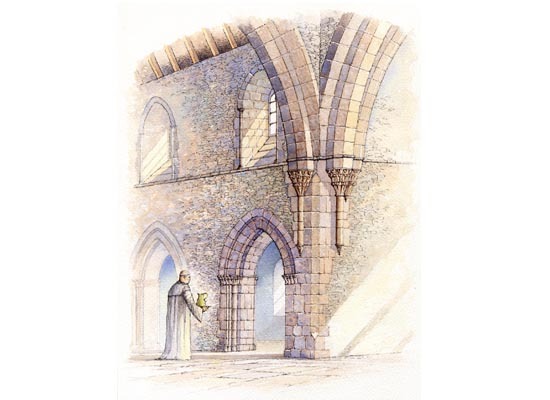 It was probably Hugh de Rous, the first Anglo-Norman bishop of Ossory, who began construction of the Close after 1202 and shortly after the formal establishment of the chapter. 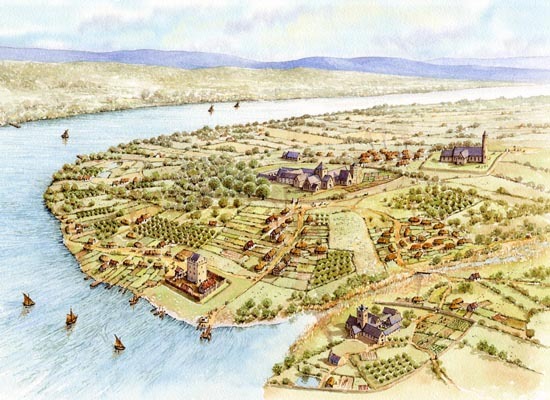 De Rous started with a blank slate by obliterating the Gaelic monastery and creating a new Cathedral landscape. The view shows the old royal palace being dismantled. Regardless of this, the history of the site was maintained by retaining the round tower and by placing ornamented fragments from the old Romanesque cathedral at key locations around the new church. The use of round-headed arches, though out of fashion at the time, provided a sense of nostalgia and religious continuity. 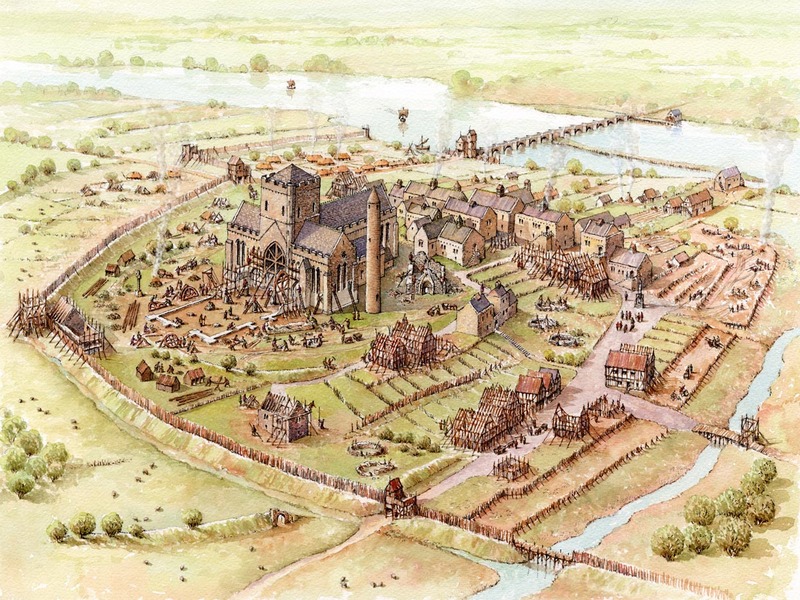 At the same time as a new Close is being laid out, the Anglo-Norman bishops are building a new town in the marsh below the Cathedral. This is the Bishop’s borough at Irishtown. Anchorites - Christian men and women - literally walled themselves up, sealing themselves into tiny cells attached to churches. There were at least two anchorholds at St Canice’s, attached to the north and south sides of the outside of the chancel. Their presence brought great prestige to the church. 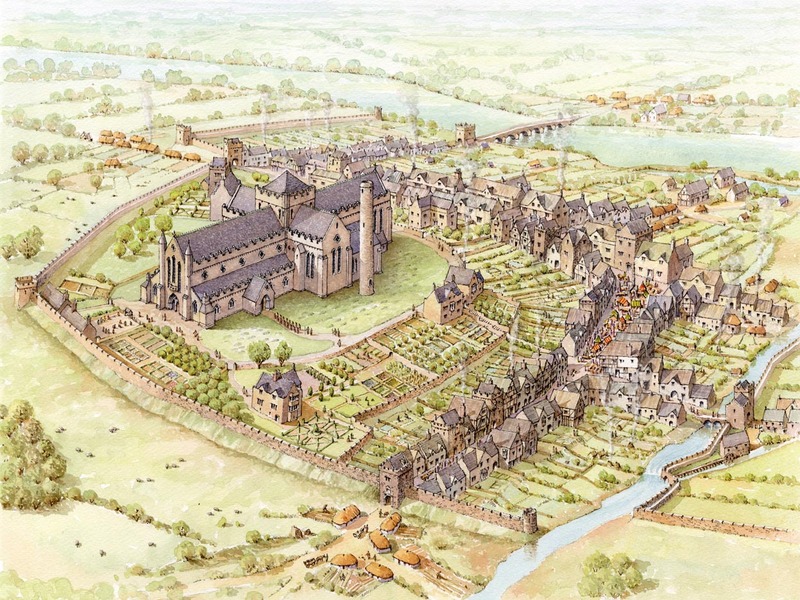 The Cathedral was the centrepiece of a walled precinct, a 'Close', wherein the canons who served the church lived and worked. Saint Canice's is the only medieval Cathedral Close to survive in Ireland today. Inside its walls the Close was a world apart from the bustling, overcrowded and cramped town below. Spacious stone houses, called 'manses', with pleasure gardens were provided to the twelve members of the chapter (the governing body of the Cathedral). The largest of the manses, the Deanery, was at the south-west corner of the Close, and the Bishop's Palace, built in the fourteenth century by bishop Richard Ledrede, dominated the opposite (north) side of the precinct. Life in the Close revolved around ensuring the daily religious celebrations took place in the Cathedral. We can imagine the important members of the chapter in their fine robes parading with their clerks and administrators across the Close from their residences to attend the mass. Hurrying behind are the young and famously unruly singing-men known as the vicars choral. Children, on their way to the renowned grammar school at the west end of the Cathedral, pass by the chanting anchorites in their tiny cells attached to the walls of the church. And in the background teams of servants, cooks, cleaners, butchers, bakers, smiths and gardeners work to keep order within the Close. This order was, however, about to be shattered forever in the 1640's. 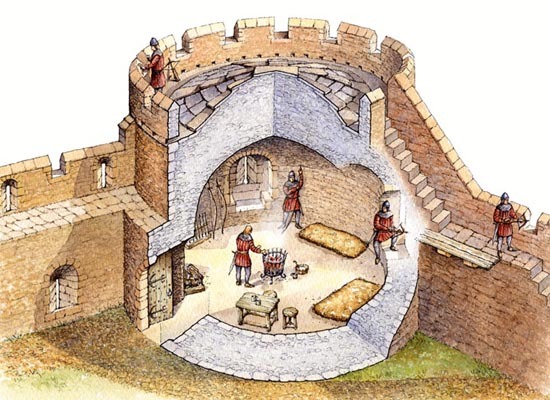 Defending the city, avoiding getting shot and getting out of the weather were the main preoccupations for the soldiers who guarded the city walls for over 500 years. In quiet times the inside of the tower was a sheltered place in which to take a break during long watches. 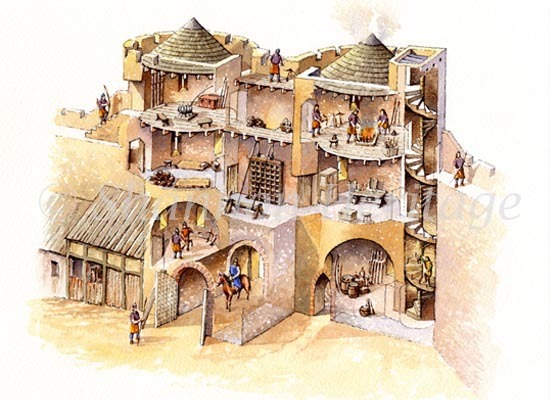 When under attack it offered the safety of good thick walls and a strong stone roof. The original 13th century tower was approximately three-quarters of its current size and had a timber roof. In the 1400s its height was raised by placing a stone-vaulted roof over the old battlements. The hazel wickerwork centring can still be seen which were left behind from the timbers used to support the stone vault during its construction. Usually the twigs from these panels rot away, but here they have survived. The square holes in the wall are called 'put-logs'. These holes held timber beams that acted as scaffolding during the construction of the tower. The three narrow windows are arrow loops. A soldier with a bow or a musket could shoot out of these whilst being protected from return fire. Outside, the parapets at the top of the walls gave some protection from attack to the defenders. 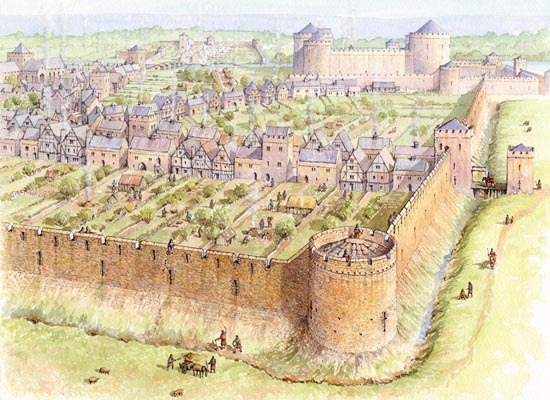 The Anglo-Norman lord William Marshal built the first city walls in Kilkenny in c1210 for colonists from England, Wales and Flanders. 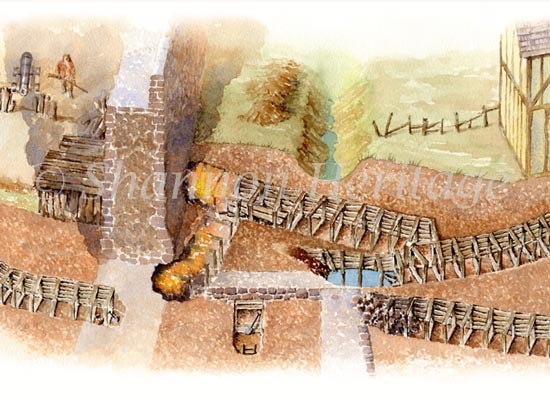 The first wall was built from oak timbers set on top of an earthen rampart, outside of which ran a ditch. Sixty years later, William’s grandson Gilbert De Clare replaced the earth and timber defences with a stone wall and towers. This view shows Talbot's Tower in the foreground, built around 1270 and renamed after the 15th century Mayor of Kilkenny Robert Talbot. The city wall enclosed three separate boroughs: Hightown, Irishtown and St. John’s on the opposite side of the River Nore. Measuring more than two miles in length, the walls were the longest in Ireland at that time. 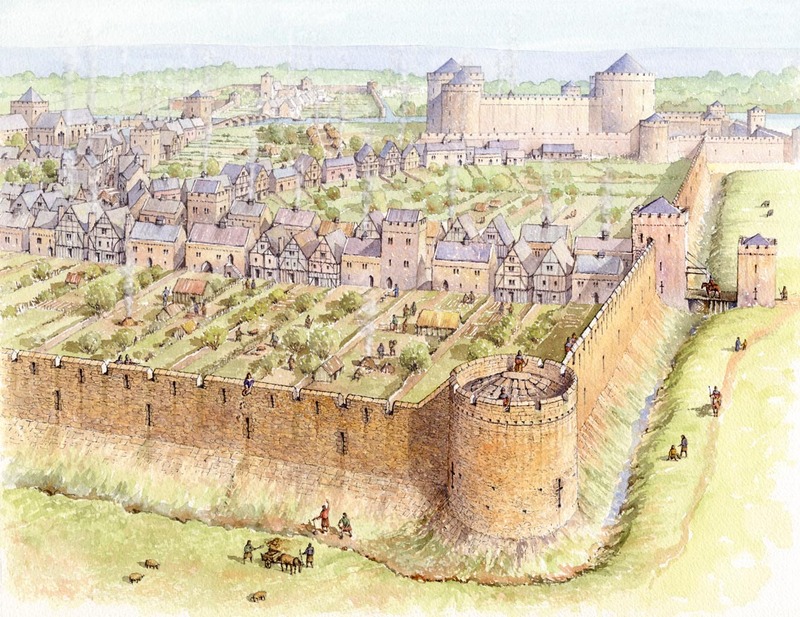 Whilst the main purpose of the city walls was to defend the colonists living inside from attack, they were also used to collect taxes. 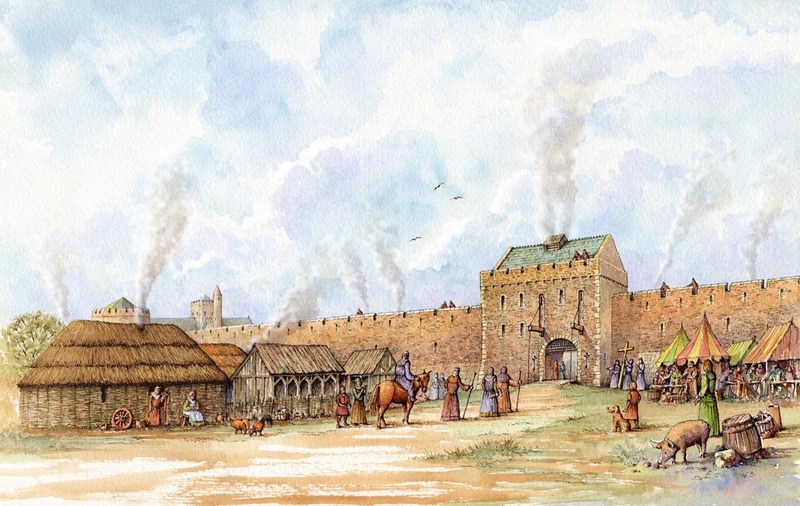 People living outside the city walls who wished to sell their goods in the marketplace had to pay a toll as they went through any of the seven city gates. 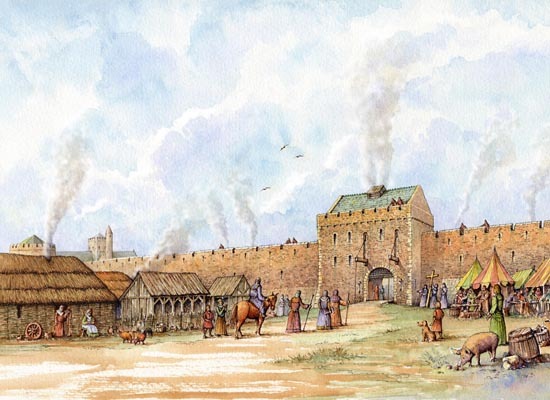 The walls were also a statement of Anglo-Norman power and authority over the native Irish, who were kept under constant surveillance from the nine towers on the city walls, one of which was Talbot's Tower. On the cliffs to the west of Portbraddan there is an early Christian site. Here the ruins of Templastragh Church stand in a small graveyard, known as the Irish Kirkyard. This church was built to replace an earlier one, which once stood nearby. 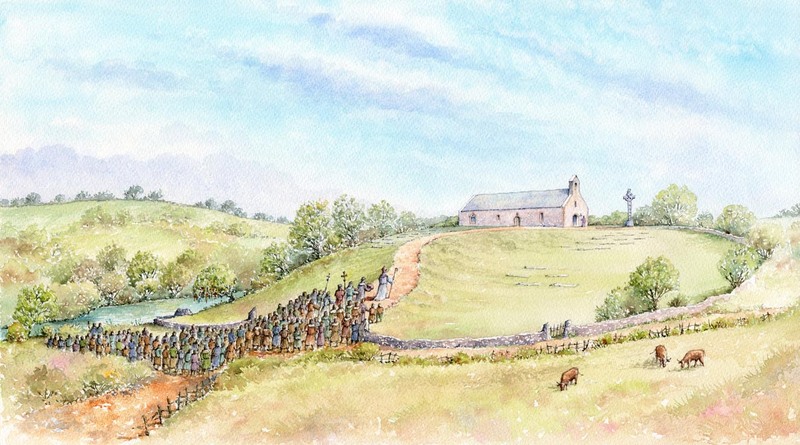 About 60 metres to the north-west of the present church ruin, in a larger graveyard called the Scotch Kirkyard, there are traces of the foundations of a small rectangular stone building, approximately 7 metres long and 5.5 metres wide. These are the remains of an older church, probably constructed around the tenth century. There is a local tradition that the church in the Scotch Graveyard was not completed because what was erected each day was mysteriously demolished each night. Those left to watch the building at night observed a blazing light over a nearby piece of ground. The founder of the church decided that this was a miraculous omen, indicating where the church should be built. 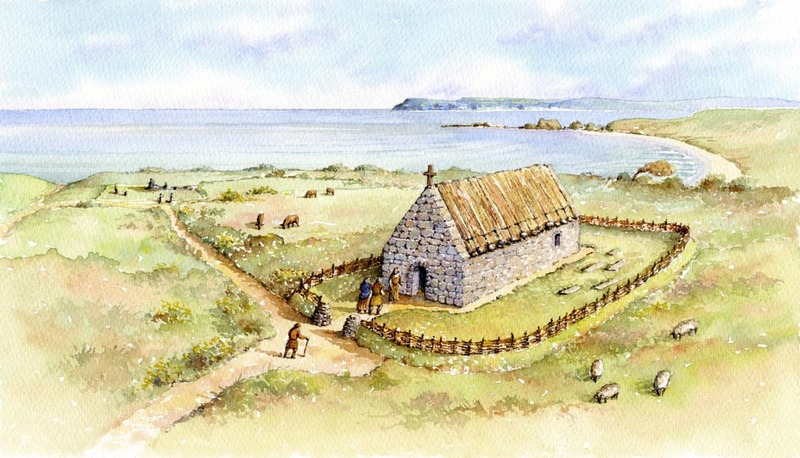 He abandoned the original site and moved the building materials to the new location, which is where the ruins of the present Templastragh Church stand. On this spot the construction of the church apparently proceeded unhindered. This story may explain why the church was called Templastragh, as the name means the ‘flaming church’ or the ‘church of the flame’. It is, however, more likely that it was named after its patron saint, Lasair, whose name means ‘a flame’. 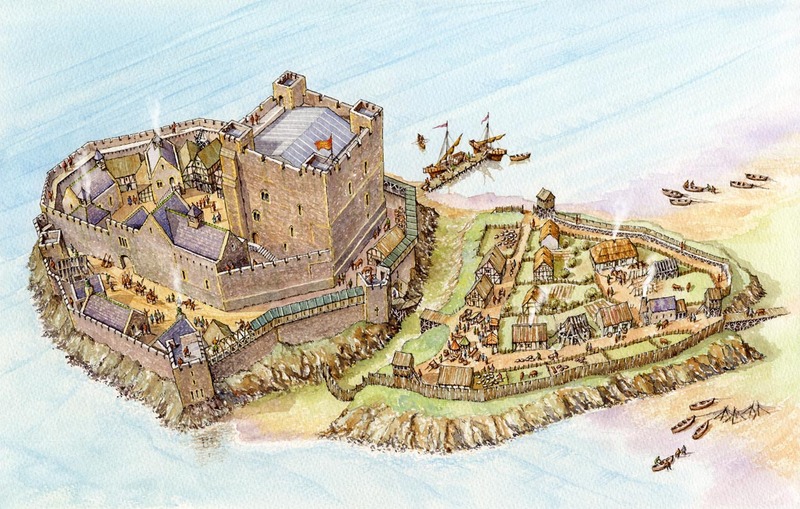 This was a series of illustrations to be displayed at the recently opened Visitors Experience at King Johns Castle. 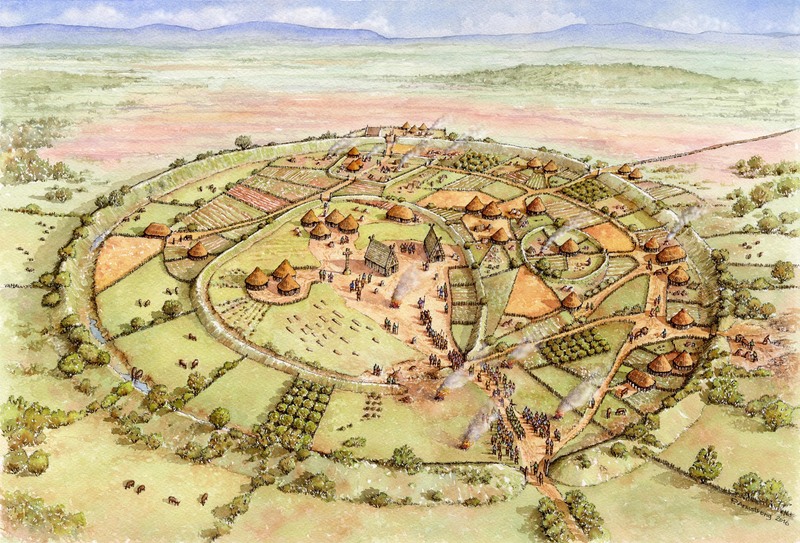 The unique, impressive and well preserved site has had a rich, varied and dramatic history dating back to the Pre-Norman period. I was extremely fortunate to have the assistance of King Johns Castle archaeologist Kenneth Wiggins, whose expertise on early military mining is represented in several publications, including the 'Anatomy of a Siege' which describes, in fascinating detail, the siege mines of 1642. 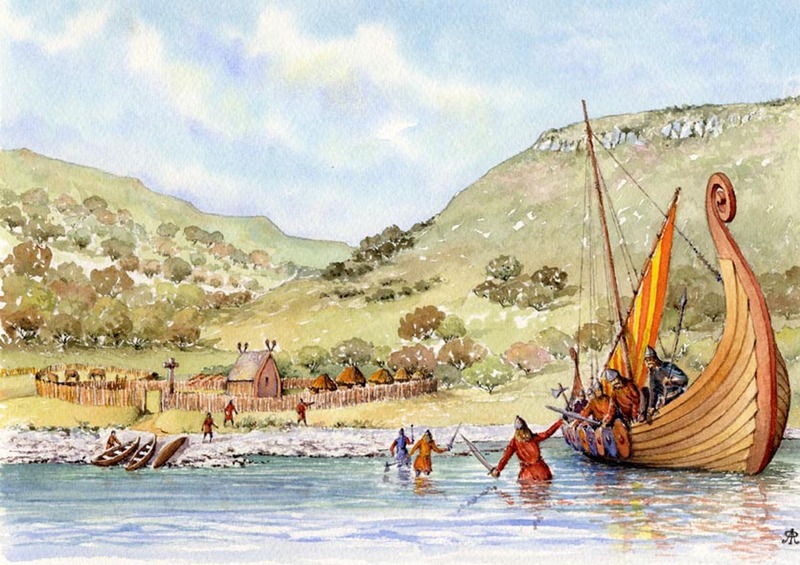 Ostmen (literally 'men from the east') were the descendants of Nordic settlers, including the Vikings, who came to Ireland in the period before the Anglo-Norman invasion. 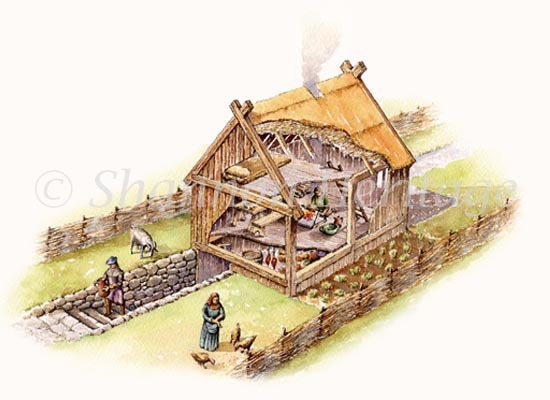 Their distinctive houses were characterised by having a 'basement' believed to have been used mainly for storage. 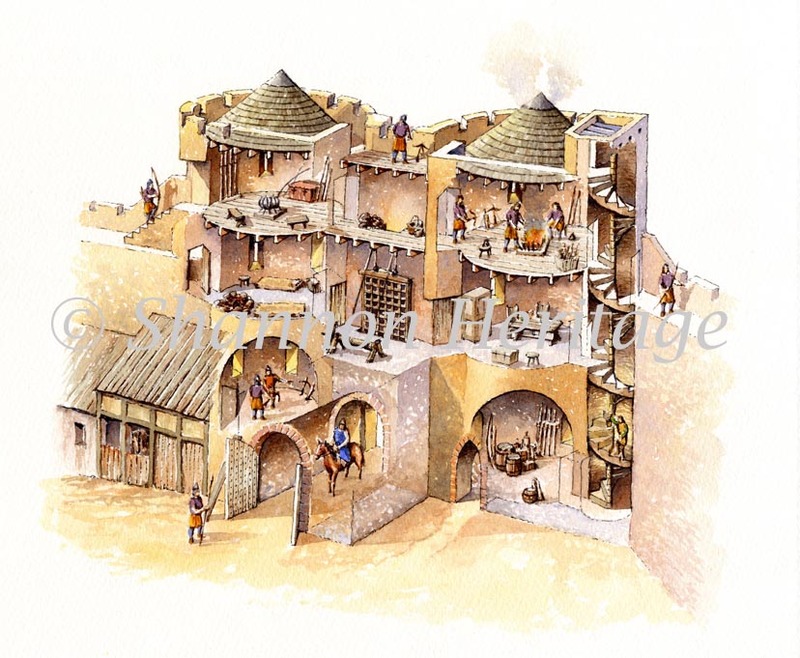 Many of the Ostmen in Limerick were merchants and the houses were built convenient to major routes. Kenneth describes a labyrinth of tunnels discovered during excavations in the 1990's. 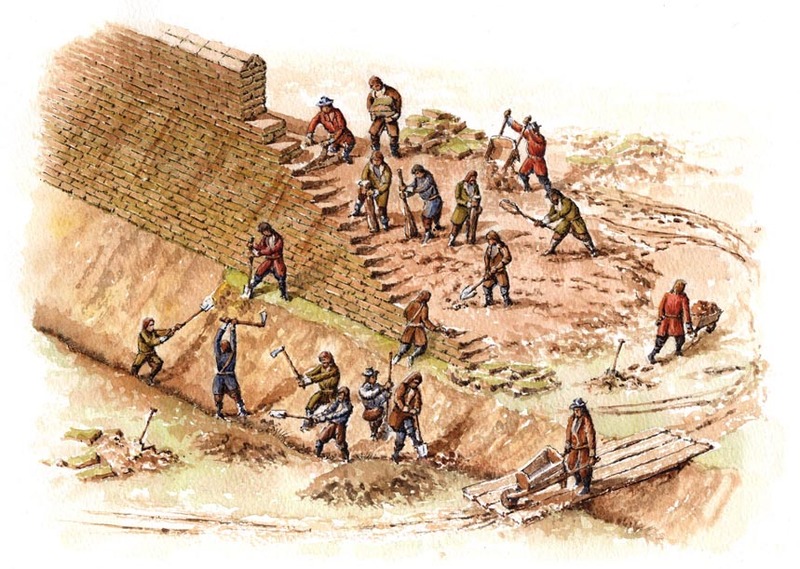 In addition to the tunnels dug by the besiegers - some from the basements of adjacent houses - the castle defenders cut countermines in a attempt to intercept and thwart the progress of the mines, with some measure of success. Ultimately some of the mines did reach their target and when the timber supports were set on fire it was only a matter of time before the wall collapsed. 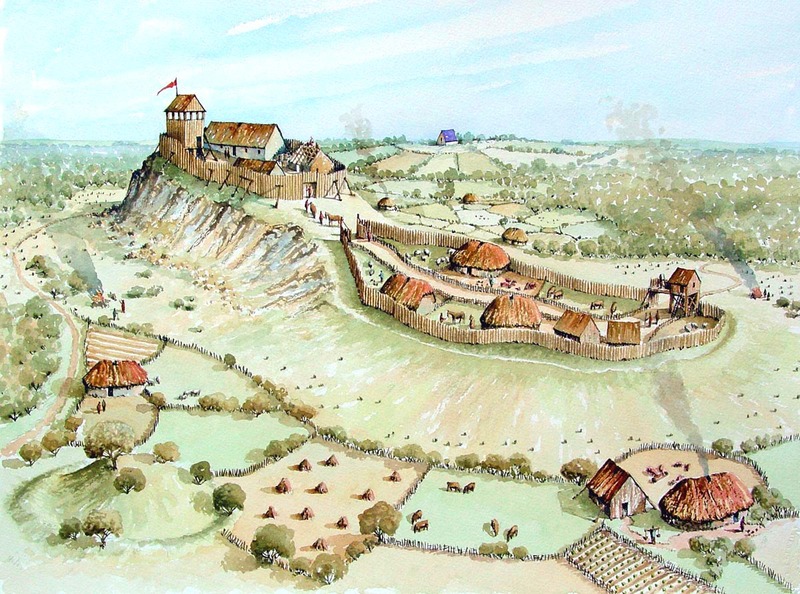 The first stone Anglo-Norman castle dates from the early part of the 13th century however excavations at the site found evidence of a circular earth enclosure with a stone revetment or facing. When the stone castle was built it exploited part of this enclosure, seen here with a timber pallisade on top. 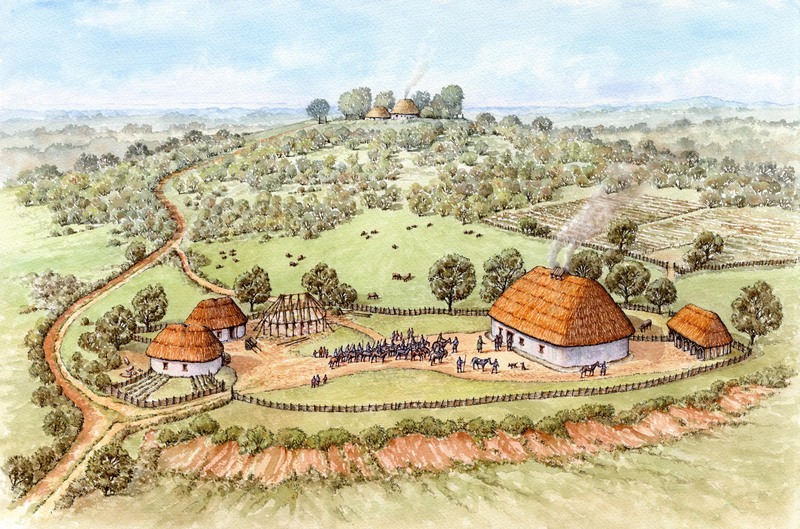 The view also shows some Ostmen houses in the foreground, the remains of which can be seen at the new Visitor Experience. 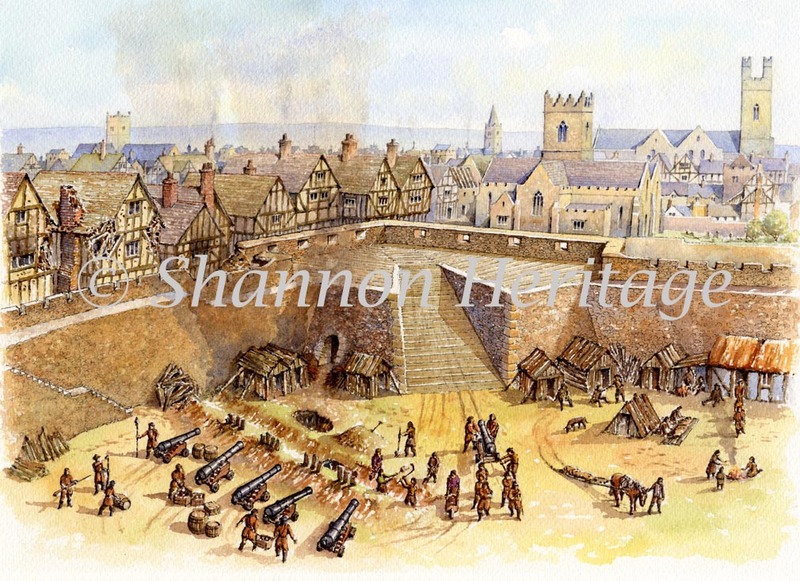 I was fortunate to have the assistance of King Johns Castle archaeologist Kenneth Wiggins, whose expertise on early military mining is represented in several publications, including the 'Anatomy of a Siege' which describes, in fascinating detail, the siege mines of 1642. Although started in the early 13th century, the stone castle was probably not fully completed until the 14th century. Being inside the newly constructed city walls the south-east corner, shown here in the foreground, was not considered as particularly vulnerable, so a small turret or 'bartizan' was added here. 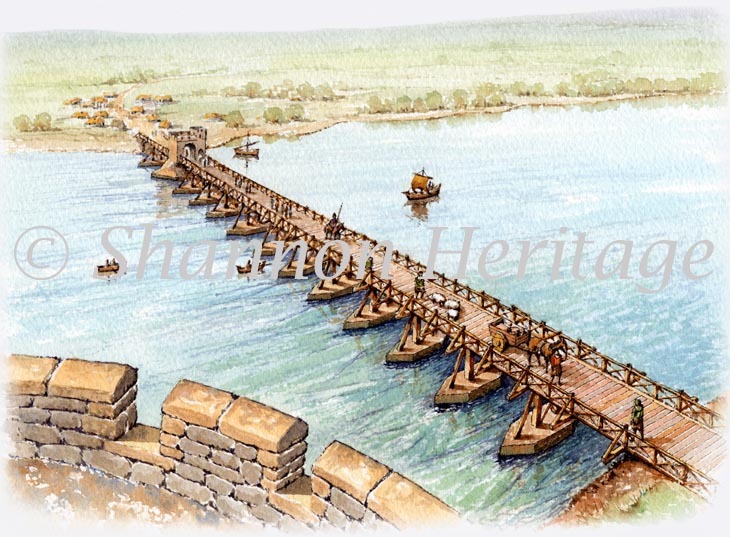 The fourteen-arched Thomond bridge would also have been built by this time. It took over a century to fully complete the stone castle with the gatehouse being one of the earliest features built at the start of the 13th century. It slowly extended southwards towards the city with intermediate fortifications consisting mainly of banks and ditches reinforced with timber pallisades. The building in the centre is thought to have been an early hall. The city of Limerick is in the background with the large church of St Mary (now the C of I cathedral) and in front of that the parish church of St Nicholas. The Shannon at King Johns Castle has been spanned by three bridges. The earliest is believed to have been contemporary with the first stone castle, built in the early 13th century. 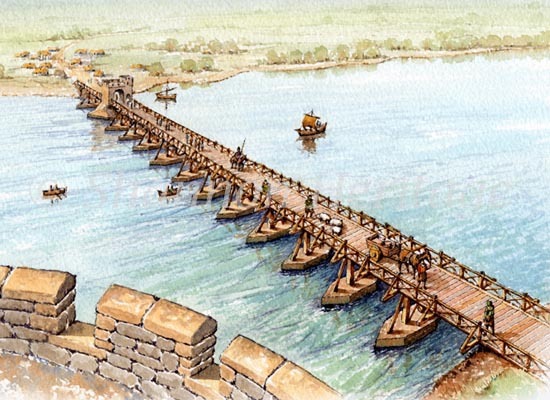 This was a wooden trestle bridge on stone pillars and was most likely fortified at each end. This bridge was the scene of an appalling disaster c1290 when part of it collapsed, killing 80 people. It was replaced by a fourteen-arched stone version which features in 18th and 19th century paintings. The present bridge dates from 1836. 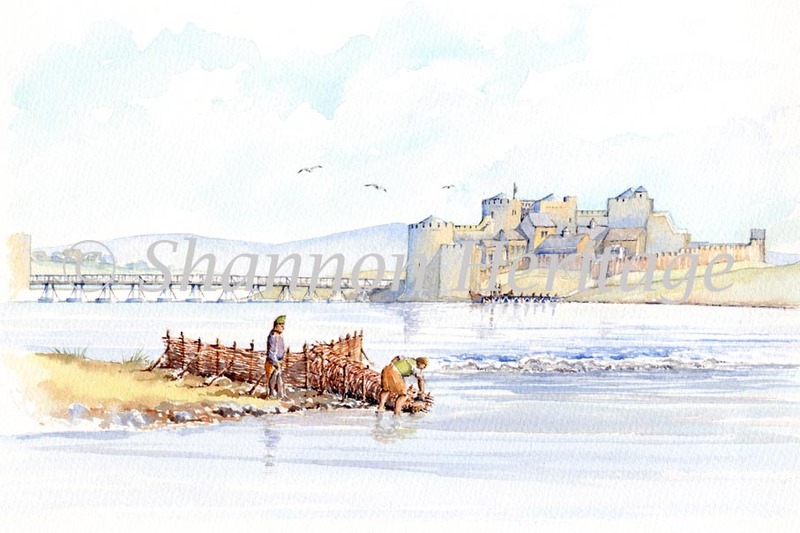 During the siege of 1642, unsuccessful attempts were made to relieve the besieged occupants of the castle and to navigate the weir on the Shannon. Additionally, a boom had been placed across the river and with forts on both banks, any ships had to run a formidable gauntlet. 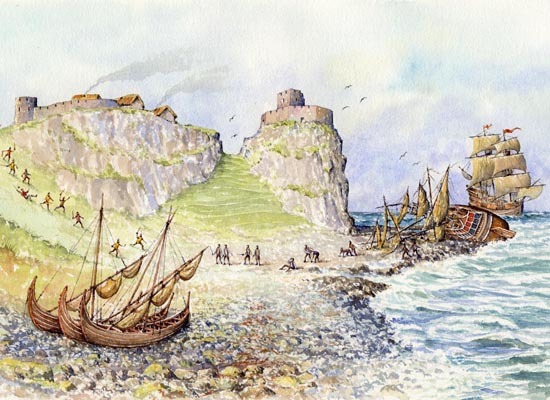 A large merchant ship, the Ruth, was fired on from the forts and at one stage lost its anchor and became stranded at low tide. A diary written by a besieged Royalist describes the final days of the siege when it was clear to the occupants of the castle that the mines were seriously damaging the south-east corner of the castle. With smoke billowing up from the ground beneath the wall, the cannon were taken down from the bastion and a final stand was made. 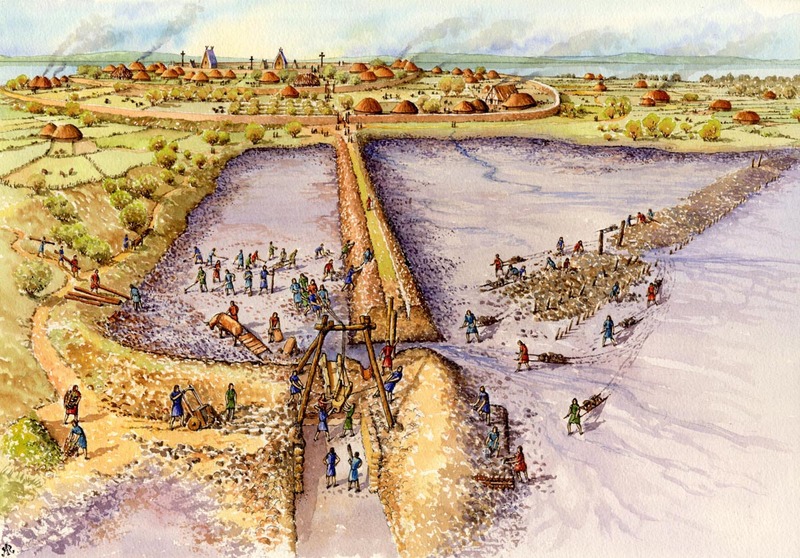 The Shannon fish traps used an ingenious method of fishing dating from very early times. The fish would be trapped behind the fencing and directed into the funnel-shaped trap body. The narrow end was plugged and it was therefore a simple matter of removing this plug and scooping up the fish. 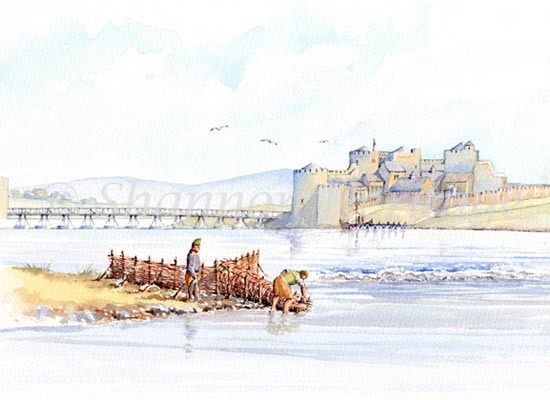 The early castle and Thomond bridge are shown here c1240. 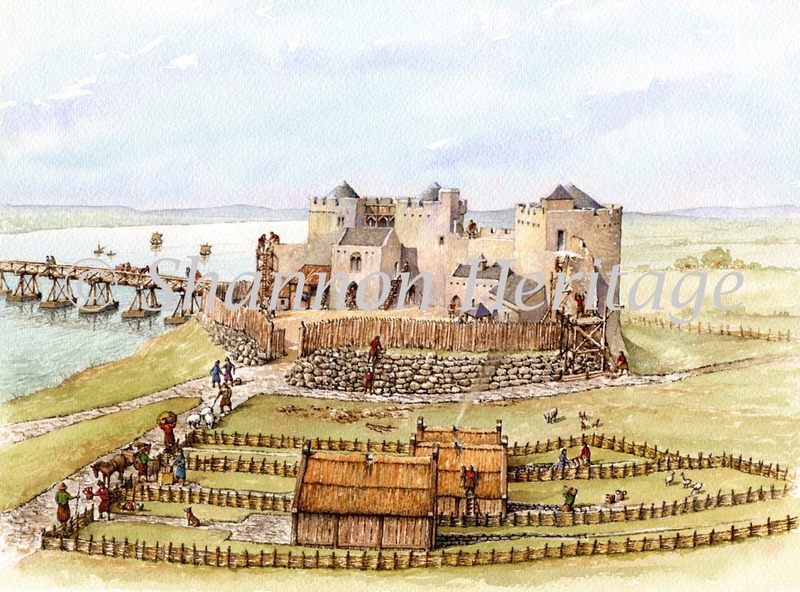 The building of the Great Hall was commenced c1280 during a period when the city walls had extended out to the castle adjacent to the Shannon. The south-west tower was also built during this surge of construction activity. The Great Hall was the largest interior building of the castle until the construction of the castle barracks in 1751. It started out as a single storey structure in what would have been a lower level of the courtyard. 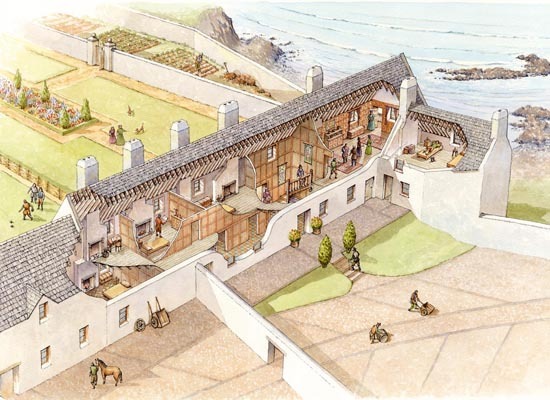 When a second floor was added, much of the courtyard was filled in and a retaining wall was built to enable access to the lower floor and the water gate. It probably also housed the Constables quarters and a dungeon. The imposing gatehouse was one of the earliest structures of the castle with twin towers accessed by a single staircase. As well as being used for storage, it was a welcome and warm relief for soldiers on duty patrolling the walls. 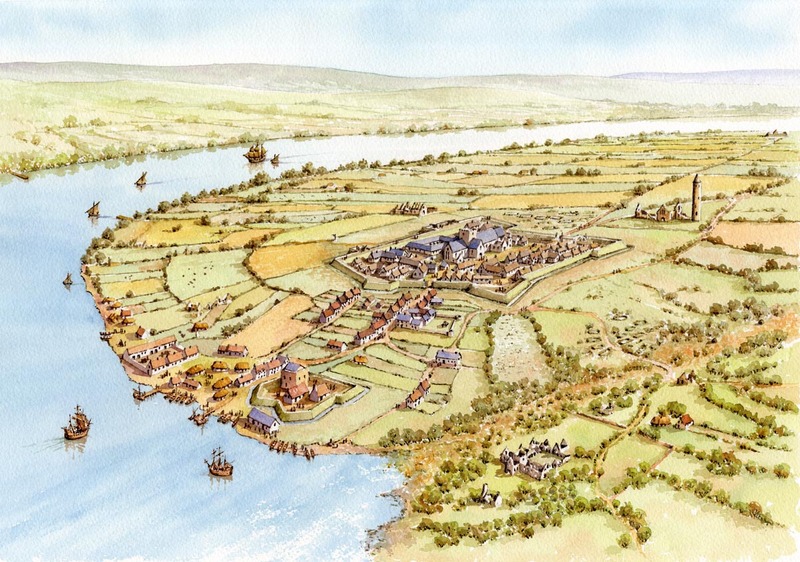 In 2012 archaeological excavations were carried out on a little known area close to Magheramason village, about 6 miles south of Derry, in an attempt to find the lost but extensive fort of Dun na Long (the fort of the ships). The site had previously been occupied by an O'Neill castle, however in 1600 Sir Henry Docwra, in order to reinforce English influence in the area, decided to build a fort there. 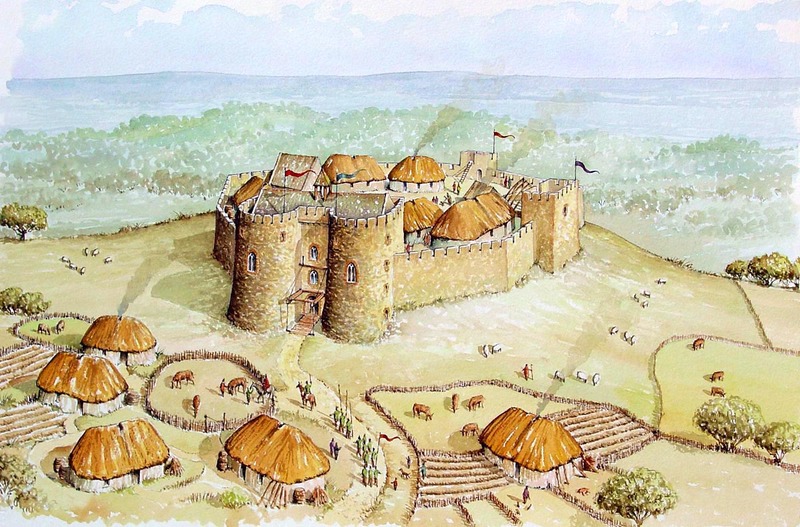 Dunnalong was fortified by creating massive earthworks around the site of the existing Gaelic castle. Mention is made of a 'great brewhouse' close to the edge of the Foyle. This would have provided a safe and palatable drink for the soldiers as the river was still tidal at this point. These forts were characterised by having pointed bastions at strategic points on which cannon were usually mounted and these enclosures were commonly referred to as 'star' forts. 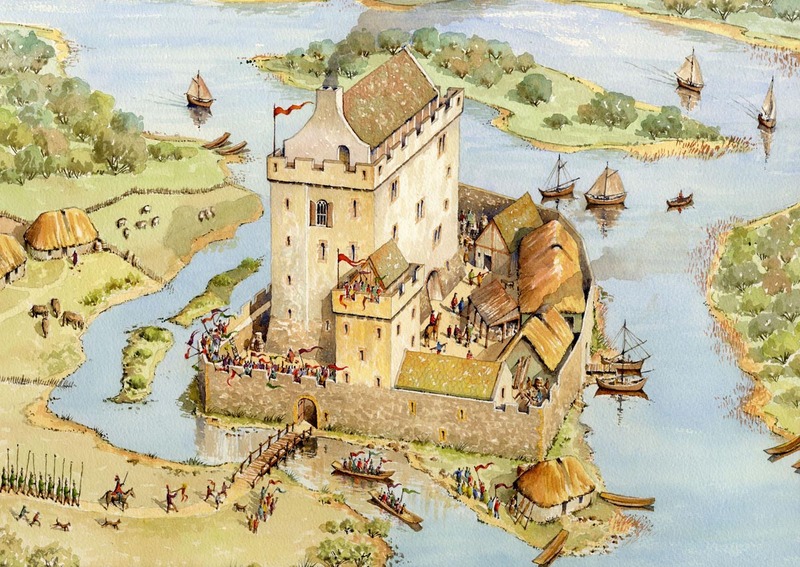 The date of the first stronghold at the site is not known but in 1568, Turlough Luineach O’Neill built a castle at Dunnalong. The river Foyle was an important artery even at that time and Dunnalong became a popular and convenient place for Scottish ships to berth, hence its name. An outer ditch was dug and the spoil deposited on the inside to form a high bank. Turves were dug from the surrounding area to face the bank and to build a low earthen wall behind which soldiers were able to take cover. This was one of two large panels I painted for the Vestfold Museum in Tønsberg, Norway. It depicts the massive plateau north of the town during the early 13th century, during the rebellion of the Birkebeiners (or Birch Legs) against King Sverre. 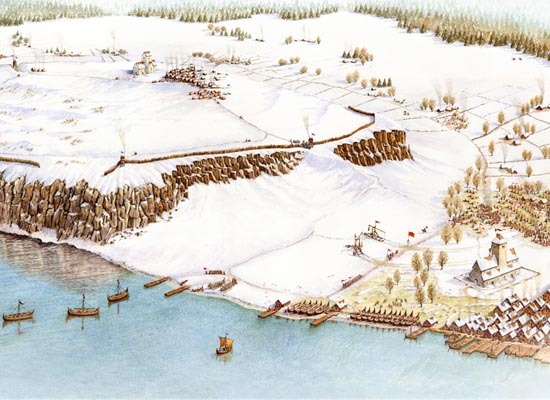 A number of retreating Birkebeiners took refuge on top of the plateau but were beseiged by the much larger forces of Sverre. After 5 months the rebels surrendered, however Sverre took ill during the siege and died shortly afterwards. This was one of the largest watercolour paintings I did at 2.5m long! 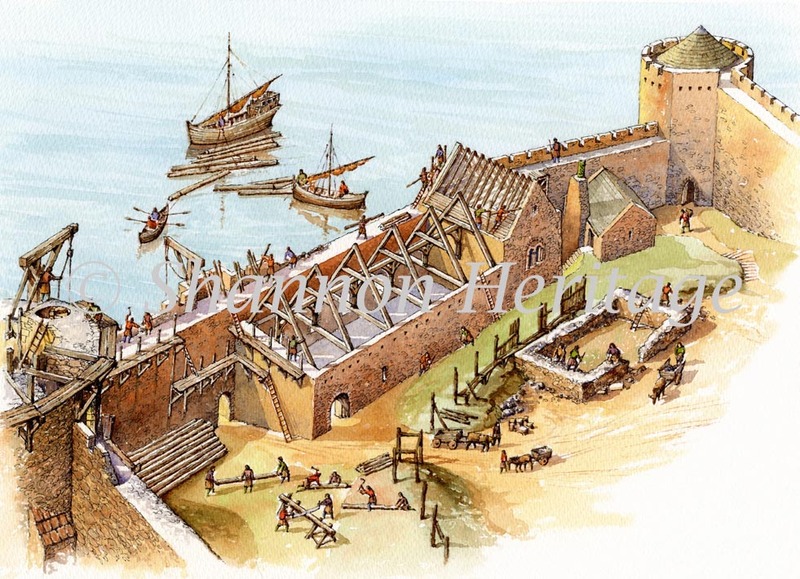 These illustrations were prepared for inclusion in the Archaeological Survey of Rathlin, just recently published. 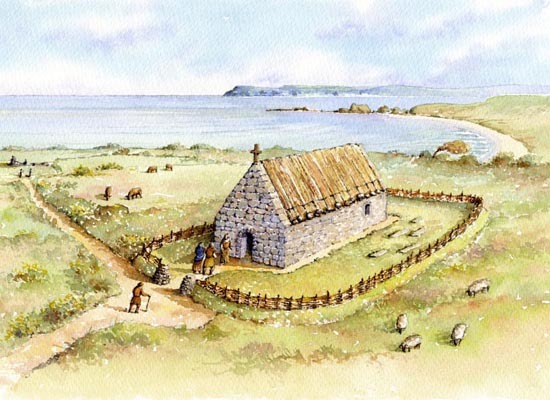 Imagine you are a monk in a monastery on Church Bay during the later part of the 8th century. You hear disturbing news from brothers in Scotland that violent men from the north have been invading and plundering communities. You ignore these rumours, thinking that these Norsemen will not venture as far as Ireland. 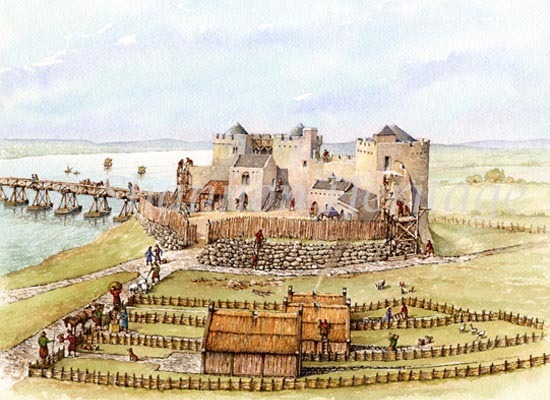 Like most Cistercian foundations, Newry had a large precinct with surrounding walls and a gatehouse. Within this was the main abbey complex occupied by the monks and peripheral buildings, farms, fish ponds and orchards tended by the laity. 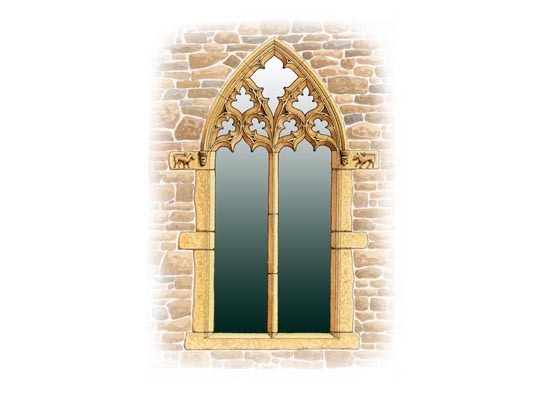 Nothing now remains of the abbey other than street names and a stone from this recreated window, now at the present Newry and Mourne Museum at Bagenals Castle. These views were prepared in 2011 for the new exhibition on site. 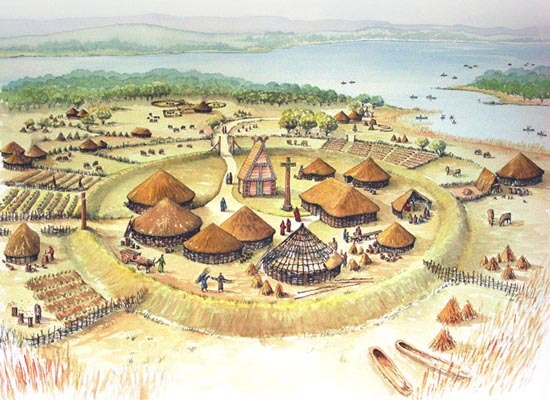 Nendrum is generally regarded as the best example of a pre-Norman monastic site in Northern Ireland. The mill house was rebuilt with a stone penstock and improved paddles, resulting in a more efficient machine for driving the mill stones. By the 10th century the technology of the 7th century mill and dam had become obsolete and a newer, more streamlined version is now shown being constructed. This involved the formation of a new but smaller dam, much of which is still visible as a stone causeway today. These illustrations were commissioned by the Northern Ireland Environment Agency primarily for the permanent on site exhibition. 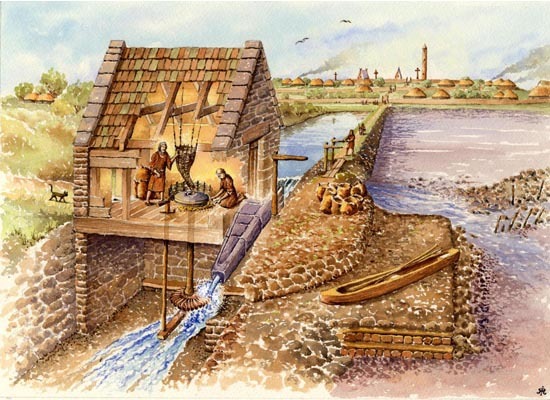 The first tide mill demonstrated the ingenuity and skill of the 7th century monks in harnessing the tides. During the incoming tide the water from Stangford Lough entered the dam by means of sluice gates. At high tide the sluices were closed and the water fed through timber chutes known as penstocks, which directed the flow on to paddles connected to vertical shafts. These in turn rotated the mill stones. This arrangement was so successful that it wasn't superceded until the 10th century. 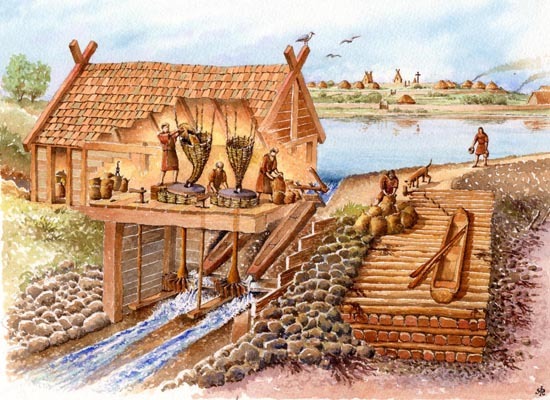 The earliest tide mill dates from the 7th century and employed a complex dam construction using a variety of materials, no doubt to cope with the frustration and danger of the strong tides. One can imagine the frenzy of activity during low tide in the race to complete the dam wall and the mill house. This unusual castle was thought to have been built around 1320 by a local Irish chieftan Henry Aimbreidh O'Neil (Harry Avery). Unusual because it has two towers forming an entrance gatehouse with no access to the castle courtyard other than a narrow flight of stone stairs. This arrangement certainly added to the security of the castle but one wonders how they ever got horses into the courtyard never mind other supplies and materials! 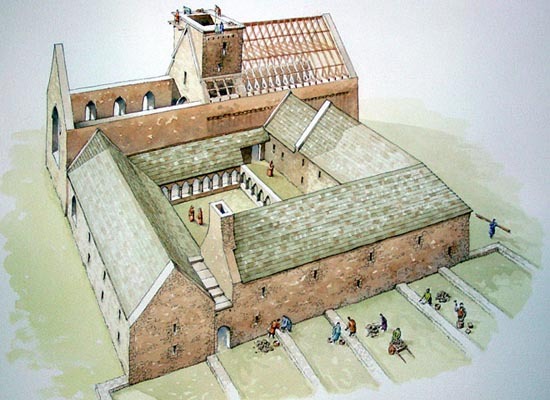 The courtyard is built on a large mound surrounded on all sides by a curtain wall which probably contained a number of small buildings - houses, stables, smithy and possibly a chapel. 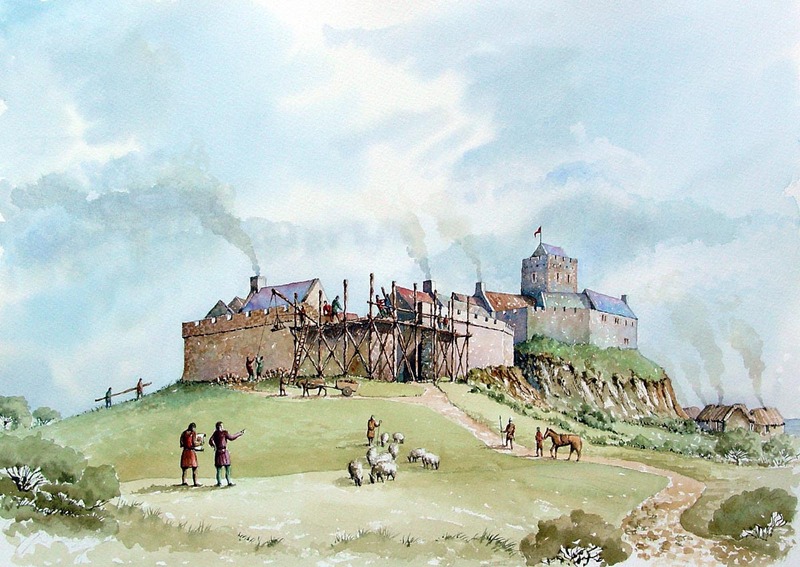 The castle was captured by the English around 1609 and only the gatehouse and mound remain. 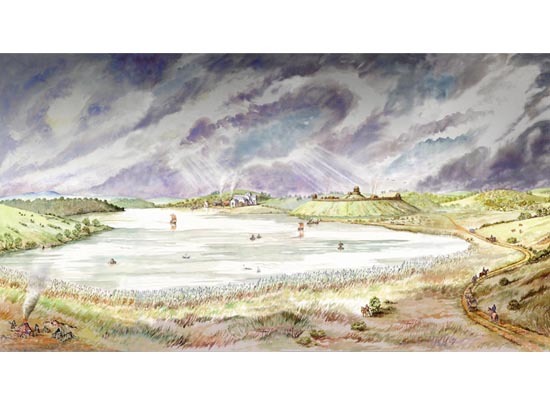 I was commissioned by the NI Environment Agency during 2008 to provide illustrations for the permanent on-site museum at Enniskillen, Co Fermanagh. 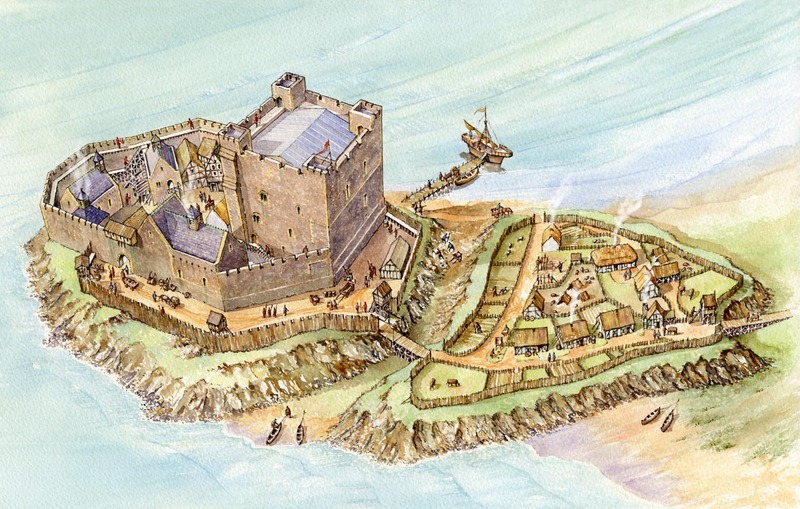 Three reconstructions were required showing the initial 1595 castle built by the Irish chieftain Hugh Maguire, the rebuild in 1610 by Cole and the castle during the mid 18th century. 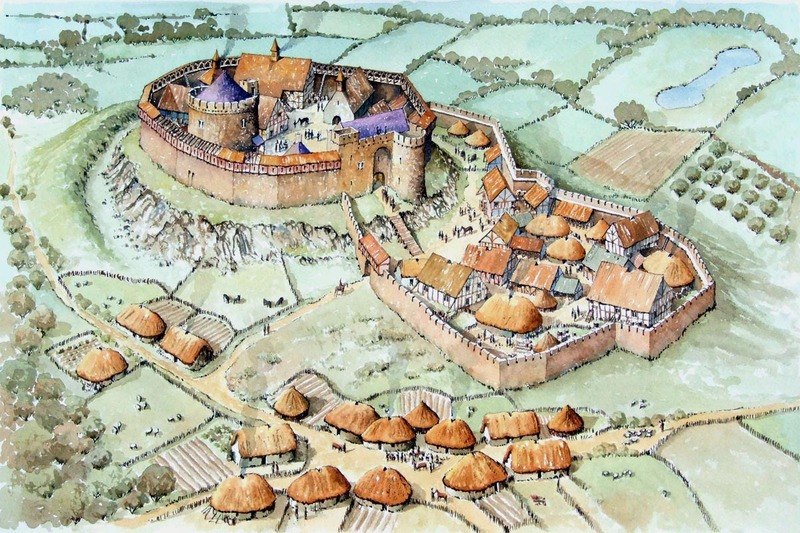 Like Bagenal’s Castle, Enniskillen Castle was fairly well documented throughout it’s history and this along with the evidence remaining made for a relatively uncontroversial proposal. 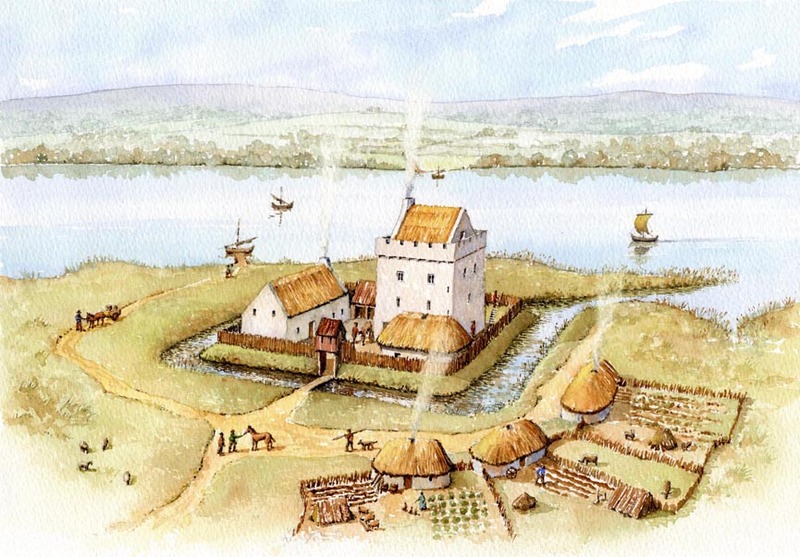 Rather than show the castle from the same viewpoint I suggested that we rotate around it and focus on the features that would have been most prominent at each period. This also had the advantage of enabling the castle to be viewed in its total surrounding environment. Located on a wooded hill north-west of Dundrum village, Dundrum Castle was built as part of John de Courcy’s coastal defenses after he invaded Ulster. It is believed to have been built in, or around 1177, and controls access to Lecale as well as dominating Dundrum Bay. Its purpose was to guard the land routes from Drogheda via Greencastle to Downpatrick. The earliest part of the castle is the upper ward, which is located on the highest point of hill and has surrounding rock-cut ditches. 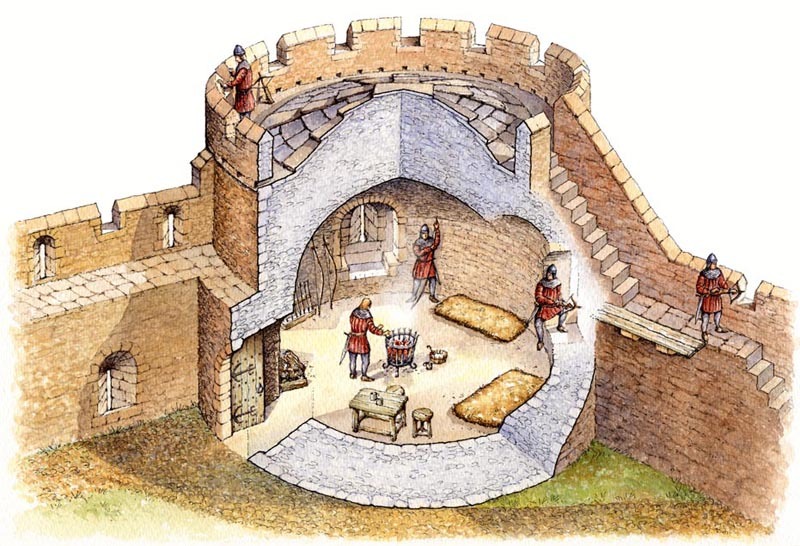 The circular keep originally had a first floor entrance, while excavations have revealed a rock cut well. The twin-towered gatehouse was added in the 13th century and is approached by a narrow east tower. The polygonal lower ward was added in added in the 15th century by the Magennises. 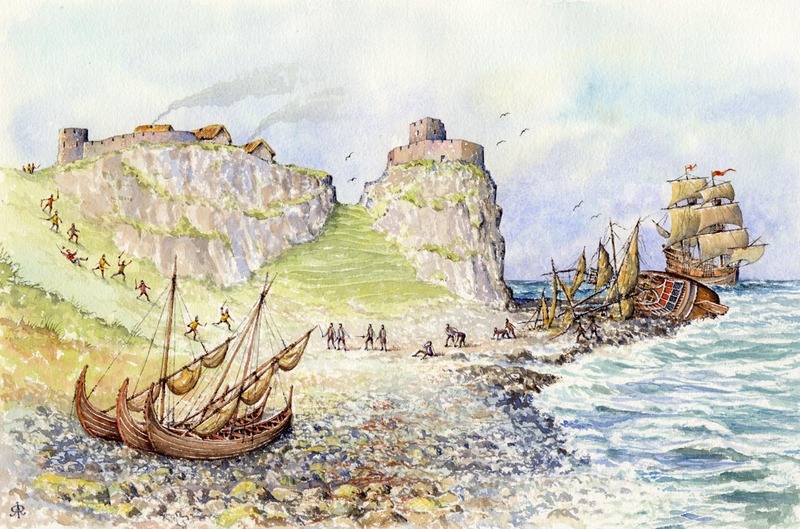 This scene depicts a dramatic shipwreck in 1551 at Port na Sassanach (Port of the English), believed to be close to Bruce's Castle. 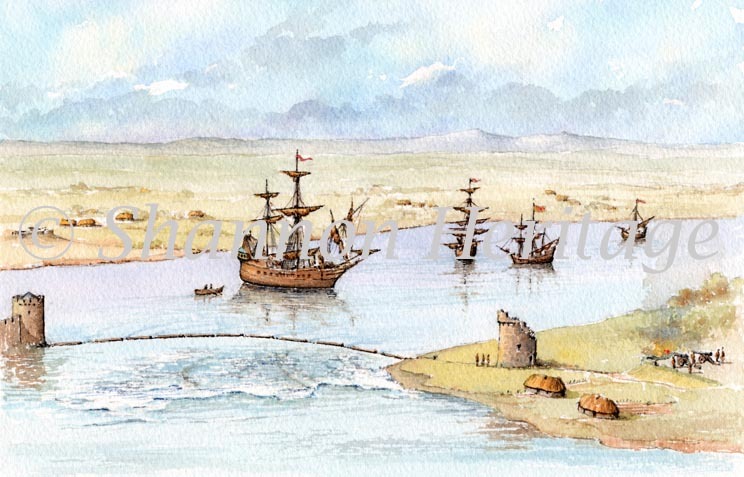 English frigates trying to oust the MacDonnells and their followers from the castle failed to negotiate the treacherous tidal conditions, leaving their crews easy prey for the island's defenders. 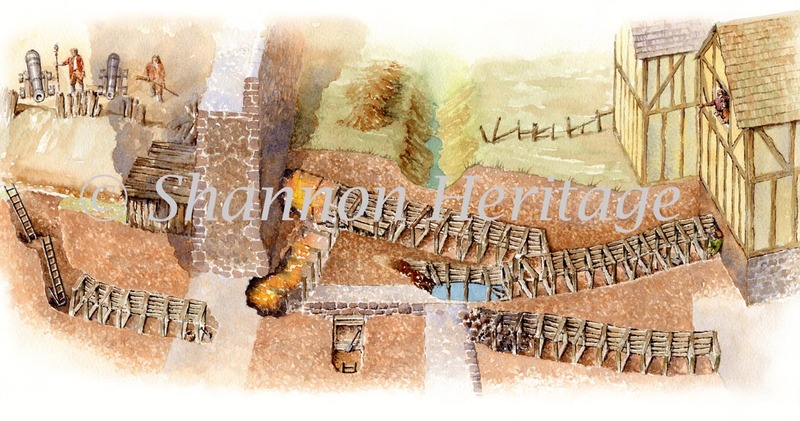 These illustrations were completed in 2010 to be used in Ruairi O'Baoills Archaeological Story of Belfast. 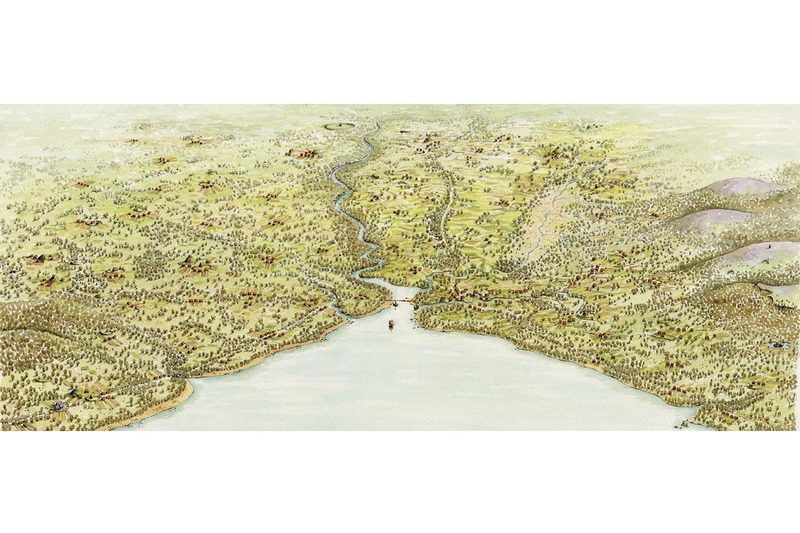 These aerial views show the Lagan Valley area from the very earliest settlers until the 17th century. They locate important archaeological sites in the surrounding area and help to explain many of the place names so familiar to Belfast residents today. 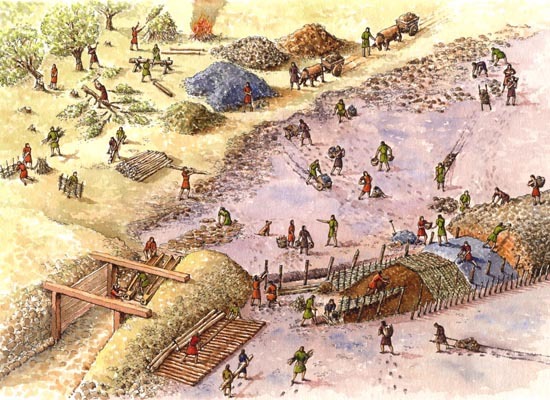 During this period much more land was cleared of trees and Medieval field systems appeared. Small settlements developed, particularly around defensive sites such as Norman Mottes and around the many ecclesiastical sites in the area. Dunmurry, Dundonald, Holywood and Shankill - to name a few. 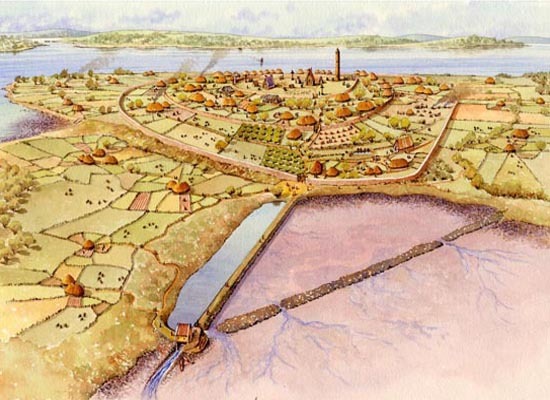 Belfast was a small town at this time, developed at the ford on the river Farset and in the shelter of a Norman castle. Built by Colla MacDonnell around 1547 Kinbane or 'White Head' castle is dramatically sited on a limestone peninsula. The remains of the tower and the enclosing stone wall can still be seen however little evidence remains of any buildings within the wall, with the assumption that most of these would have been constructed of timber. It is a beautiful and secluded location, well worth the trek down a cliff path where views of the castle can really be appreciated. The little ships are sailing from Islay, seen in the distance beyond Rathlin. Thought to have been set-up by St Machaoi in the 5th century, it has also been linked to St Patrick in later sources. The monastery consists of three circular dry-stone walled enclosures, one within the other, with evidence of industrial work in the outer enclosure. The central enclosure has a church ruin with sundial, the remains of a round tower and a graveyard. The middle enclosure contains remains of huts and workshops. A fascinating discovery was made during recent excavations when what is believed to be the earliest known tide mill, dating from the 7th century which was replaced within 200 years later by a more efficient design. This view shows the 10th c monastery with the tide mill and its dam in the foreground. A fascinating discovery was made during recent excavations when what is believed to be the earliest known tide mill, dating from the 7th century. 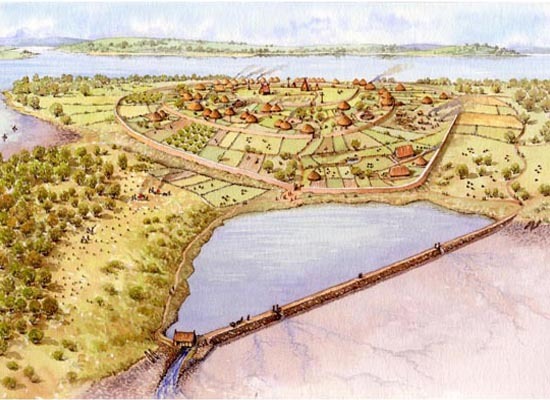 This view shows this 7th c monastery with the tide mill and its dam in the foreground. 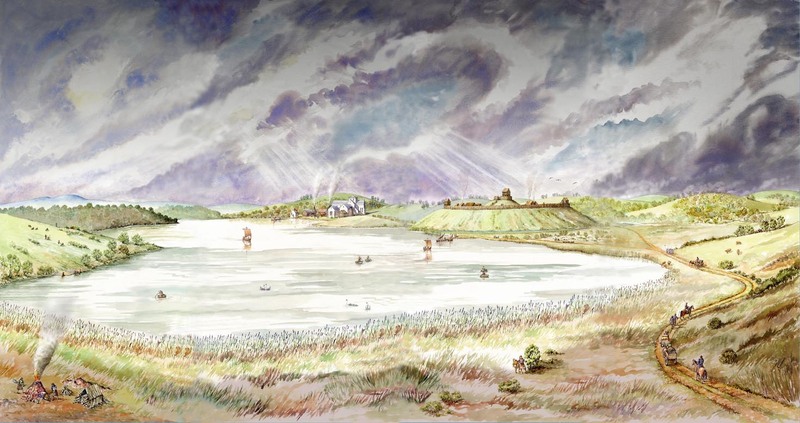 These illustrations were commissioned by Ballymena Borough Council to be used in one of the displays for the new museum. They will be included in animation sequences showing how frontiers changed dramatically during the middle ages. The first castle at Clogh was believed to have been a Norman motte and bailey, exploiting the natural rock outcrop rather than building the usual earthen mound. The Norman de Mandeville family lose control of the castle to the MacQuillans who also occupy Dunluce castle at this time. 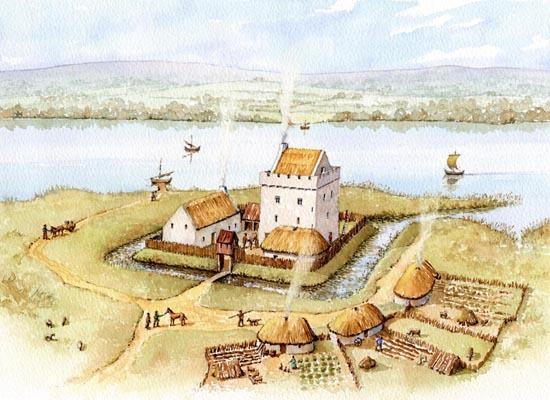 The gatehouse is the only physical evidence remaining of the castle and was disproportionately large compared to the existing buildings. It was built by Randall MacDonnell who gains control of the castle from the McQuillans. Bagenals Castle was rediscovered during work being carried out at McCanns Bakery in Newry. Unusually thick walls were found during this work and these were later identified as being part of the original 16th century castle. A map of c1568 shows the then partly walled town of Newry and pinpoints the location of Bagenal's Castle along with other features in the town. 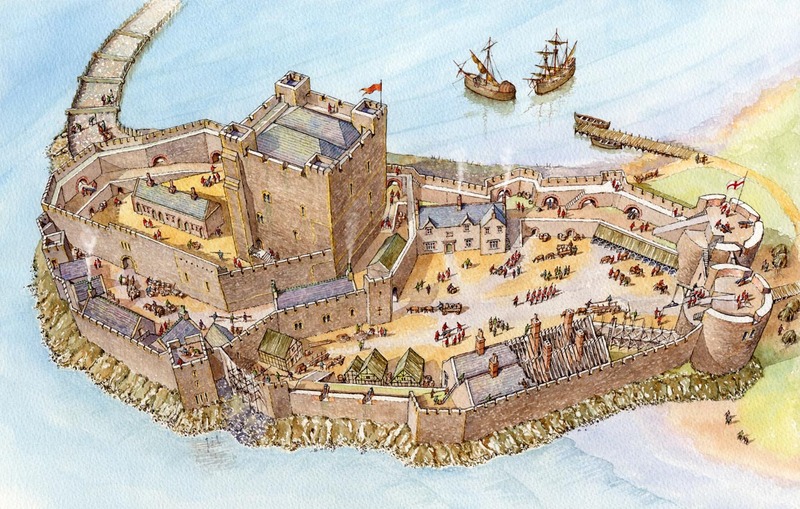 The castle has been restored and now houses the new Newry and Mourne Museum. It was three storeys high and was 'T' shaped with the stair tower at the front. It is also believed to have had a bawn. An early map shows an orchard behind the castle. An example in the Methodology section gives details as to how this view was prepared. 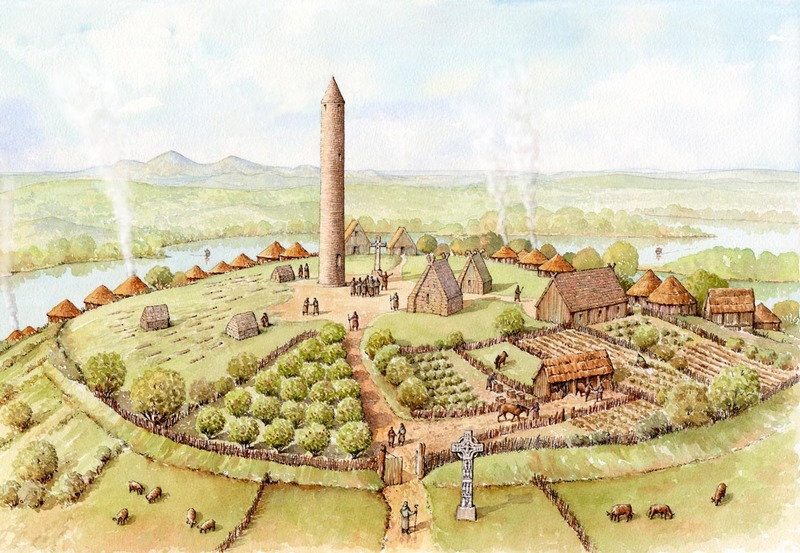 The illustrations for the permanent exhibition at Devenish Island were completed during the spring of 2005. 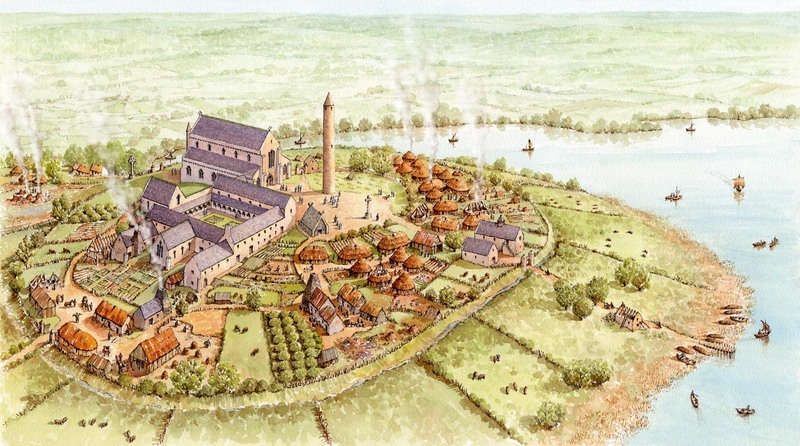 Devenish Monastic Site is generally considered to be the most important of Lough Erne's many island church settlements. 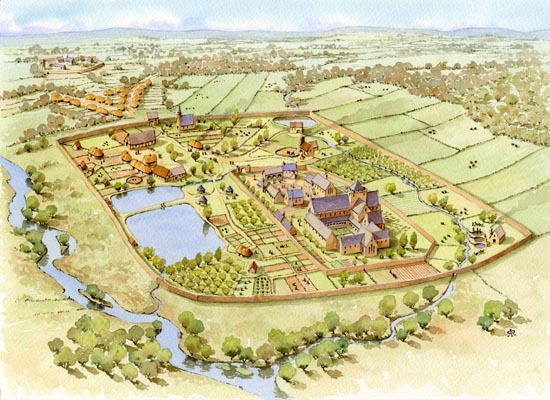 Devenish was founded in the 6th century by St Molaise. 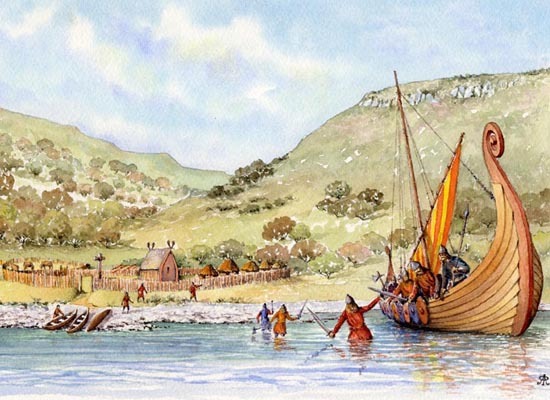 It was raided by Vikings in 837 and burned in 1157. Shortly after this date the monastic buildings were rebuilt of stone, including a round tower to act as a belfry and the storage of valuable relics. There is evidence of another round tower close to the present one and it is thought that this may have been an earlier one. 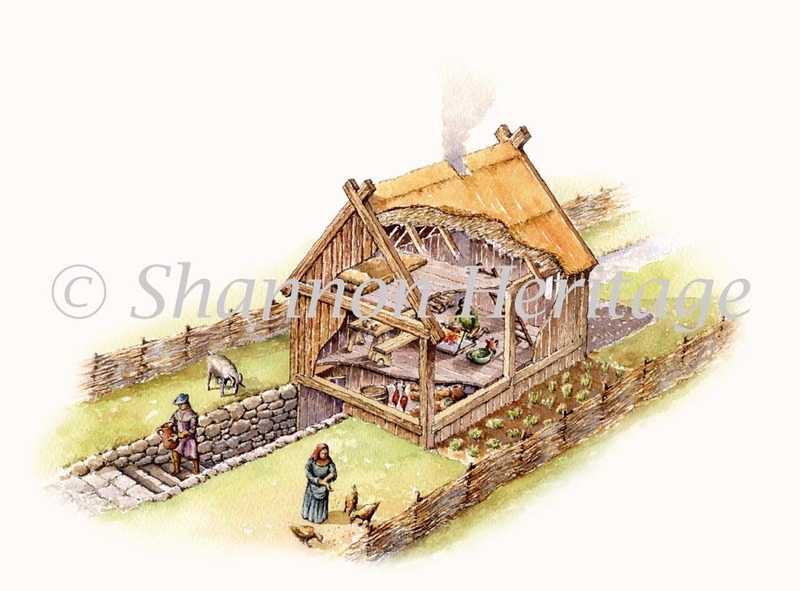 The illustration shows the builders re-using the stone to build the new one. Devenish Monastic Site is generally considered to be the most important of Lough Erne's many island church settlements. Devenish was founded in the 6th century by St Molaise.It was raided by Vikings in 837 and burned in 1157, but in the Middle Ages flourished as the site of a parish church and St Mary's Augustinian Priory. There are extensive low earthworks on the hillside, but the earliest buildings are St Molaise's House (a very small church) and the fine round tower close by, both with striking Romanesque decorations from the 12th century. This is one of the finest towers in Ireland and they were thought to have been used to store valuable relics as well as a belfry.The entrances were always at first floor level to enable the monks to raise the ladder in times of attack. St Mary's Augustinian Priory on the hilltop dates from the middle 15th and early 16th centuries, with church, tower and small north cloister. In its graveyard stands an unusual, intricately-carved cross of the middle 15th century. Devenish Monastic Site is generally considered to be the most important of Lough Erne's many island church settlements. 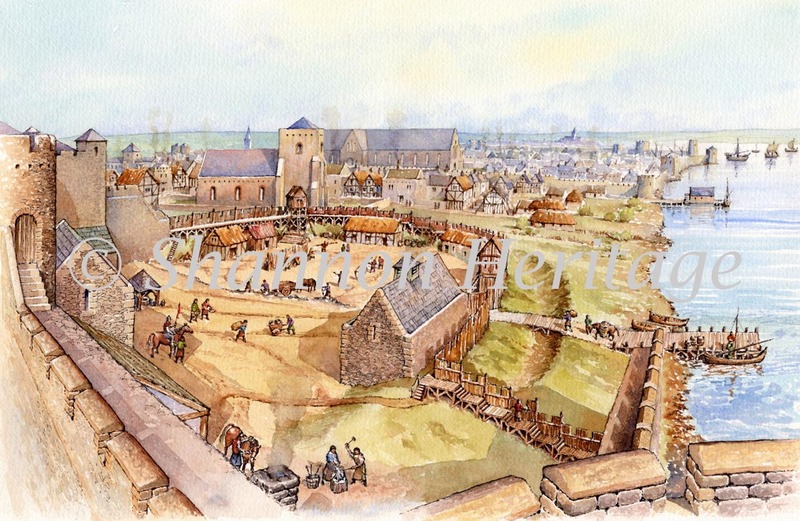 Devenish was founded in the 6th century by St Molaise. It was raided by Vikings in 837 and burned in 1157, but in the Middle Ages flourished as the site of a parish church and St Mary's Augustinian Priory. Teampull Mór, the lower church, dates from the early 13th century and has a beautifully moulded south window. 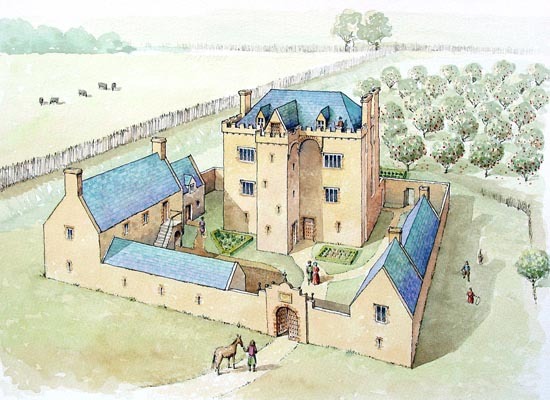 It was extended to the east in about 1300, while later additions include a residential wing to the north and the Maguire Chapel to the south, with 17th century heraldic slabs. Devenish Monastic Site is generally considered to be the most important of Lough Erne's many island church settlements. 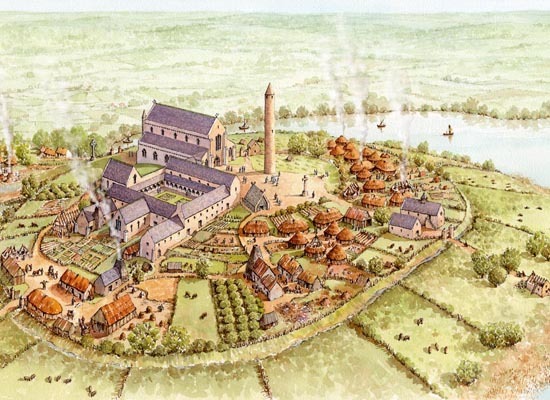 Devenish was founded in the 6th century by St Molaise. The first buildings would have been built from timber - there being a plentiful supply on the island during this period. This illustration shows the island, which was heavily wooded at this time, being partially cleared to make way for the new settlement. Google Maps are available for relevant items however these can slow down your browsing experience. Select Maps using the button.